Congratulations on your upcoming wedding – an incredibly exciting (and busy) time in your life! Here at Craig Parry Photography, we understand that organising your special day can be quite an overwhelming experience, so we make it our business to make your wedding photo shoot as relaxed and enjoyable as possible. Based upon the premise that no two individuals or weddings are the same, we work closely with each couple to identify their unique vision and then customise an affordable photography package to make this a reality. 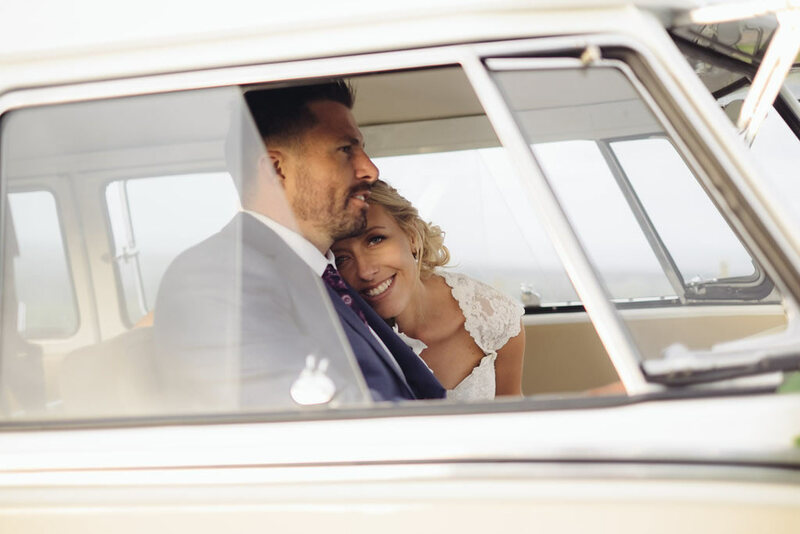 The result - candid, natural and creative imagery which reflects you as a couple and the many unforgettable moments of your special day - delivering treasured images to last a lifetime. With over 20 years of experience as a professional photographer, Craig’s work has received many accolades and is known and admired both locally and internationally. 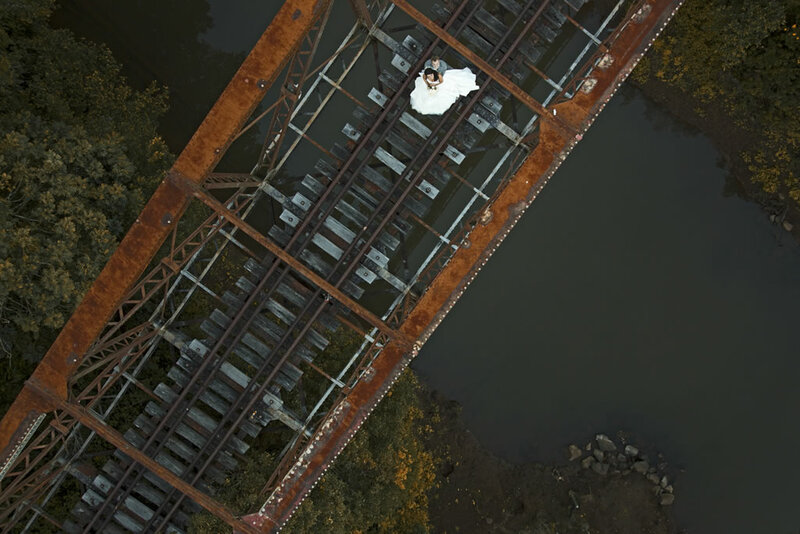 As Sony Global Ambassador he uses only the latest, top of the range equipment and (for those looking for something a little different) is also highly qualified, CASA certified aerial photographer. As a Lennox Head local, Craig started his photography journey immersing himself in the natural wonders of the area. Since picking up his first camera, his career has gone from strength to strength and now spans a wide variety of genres. Having received many prestigious accolades, his work has been widely recognised on the international stage and is also greatly admired by the local community. We understand that every decision you make to plan your big day is important so would welcome the opportunity to discuss your specific requirements in more detail. Over the past ten years my cameras have taken me on adventures around the world. I’ve been incredibly fortunate to have been there to witness some unique, breath taking moments. It’s almost like my camera has been the ultimate back stage pass, getting me into places and situations I would never otherwise have found myself. 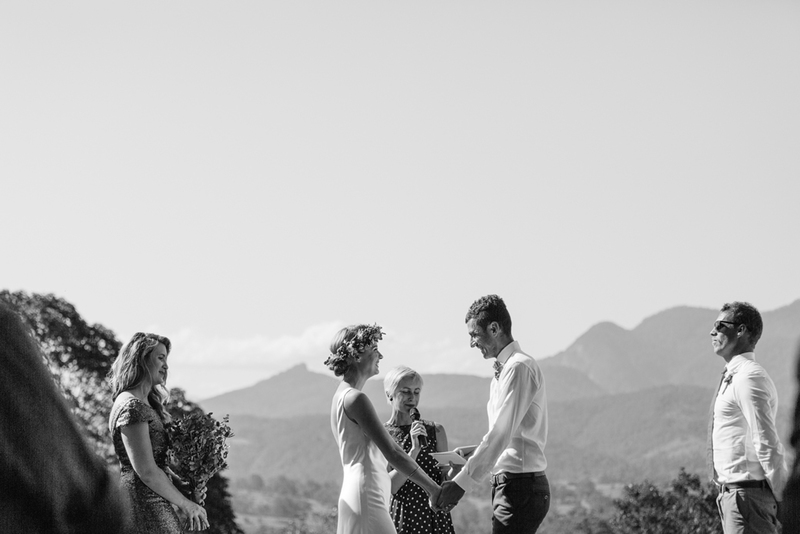 After working in Europe for many years, I now call the spectacular Northern Rivers home and am truly blessed to work as a Byron Bay wedding photographer. 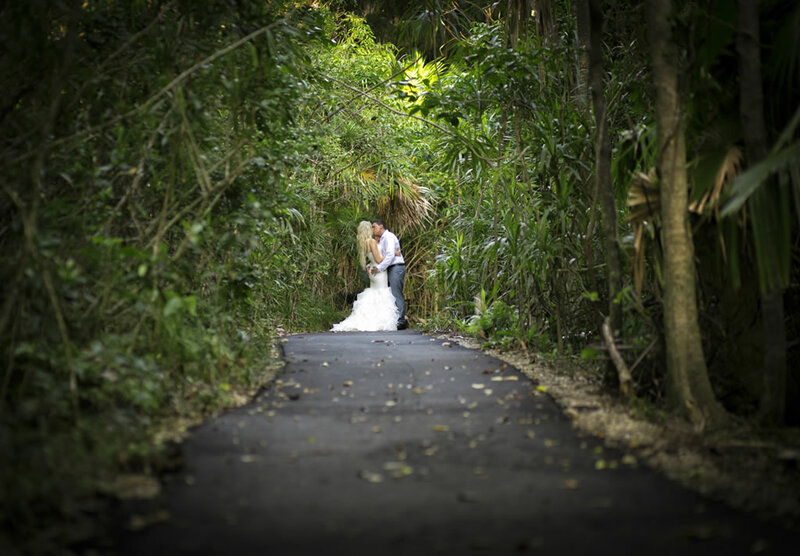 I’m a wedding photographer based just down the road from Seven Mile Weddings in Lennox Head. Although I regularly travel across Australia to work with some amazing couples, there’s nothing better than shooting here in my own back yard. 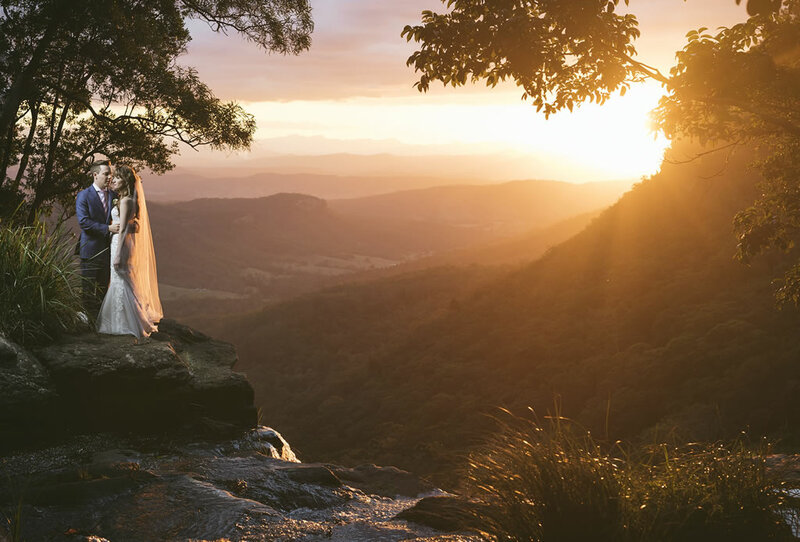 I absolutely love this region and it offers stunning backdrops for your wedding day. As a wedding photographer, I’m a firm believer that how you feel the moment your picture is taken has the biggest impact on how you feel when you see the photograph again. So if you feel uncomfortable, nervous or any other negative emotion, when you look at the image, weeks, months or even years later, that emotion will be how you see yourself. Now imagine, looking back on an image from your wedding day on your golden anniversary and remembering how you laughed so hard because your husband had just told you the funniest, filthiest joke you’ve ever heard, or how you beamed like you were going to explode because he had just whispered the most romantic thing into your ear and at that precise moment never in your life never had you felt more loved. Heck, even if the picture was out of focus and looked terrible I bet you’d still smile every time you saw it! My approach is simple, it’s not about posed moments, but about giving you space and opportunity to be in the moment together then capturing that authentically. Many of the couples I work with often tell me how they hate having to “pose” for pictures and I totally get it. I’d love to hear about you and your wedding, so get in touch and let’s make something awesome. Picture this. 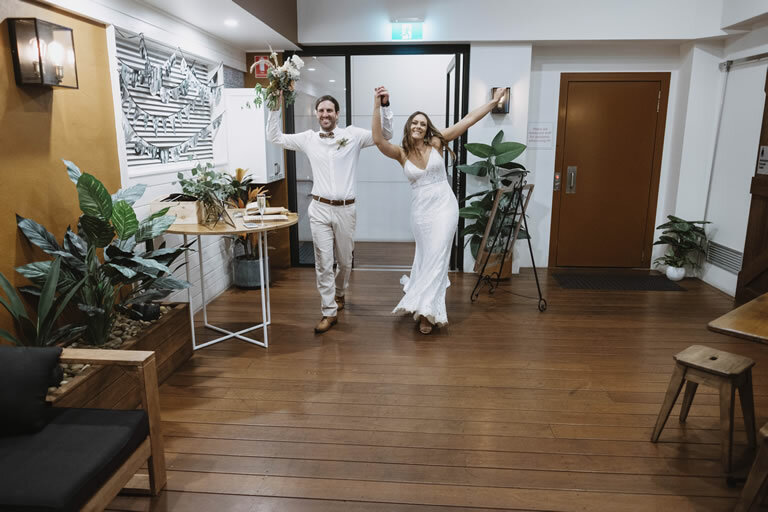 Your wedding was an absolute hoot!​ Your guests thought it would start with a mind-numbing service and eventually a fun reception. 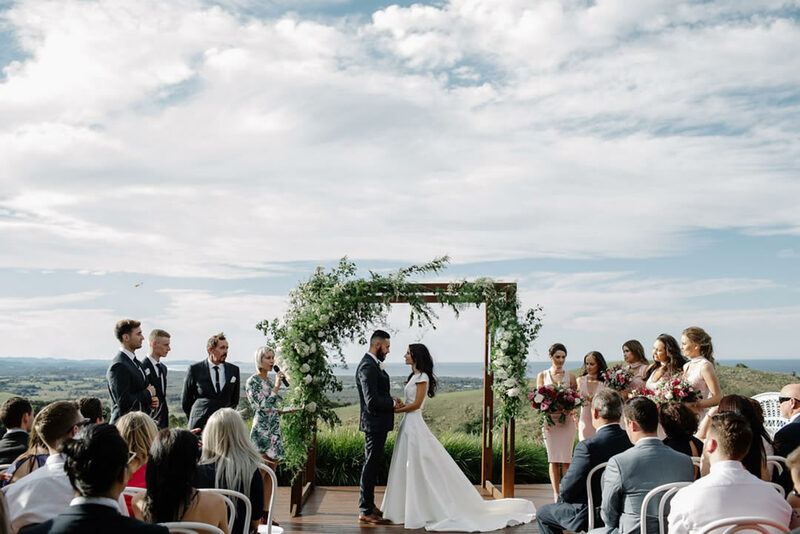 Instead they were so impressed by your entertaining Lennox Head Wedding Celebrant, Jacqui Patterson and how the revelry got into full swing the moment she appeared. Who wants to endure uninspiring when you can celebrate? Jacqui, the Champagne Celebrant exudes enthusiasm and excitement to ensure a treasured experience. 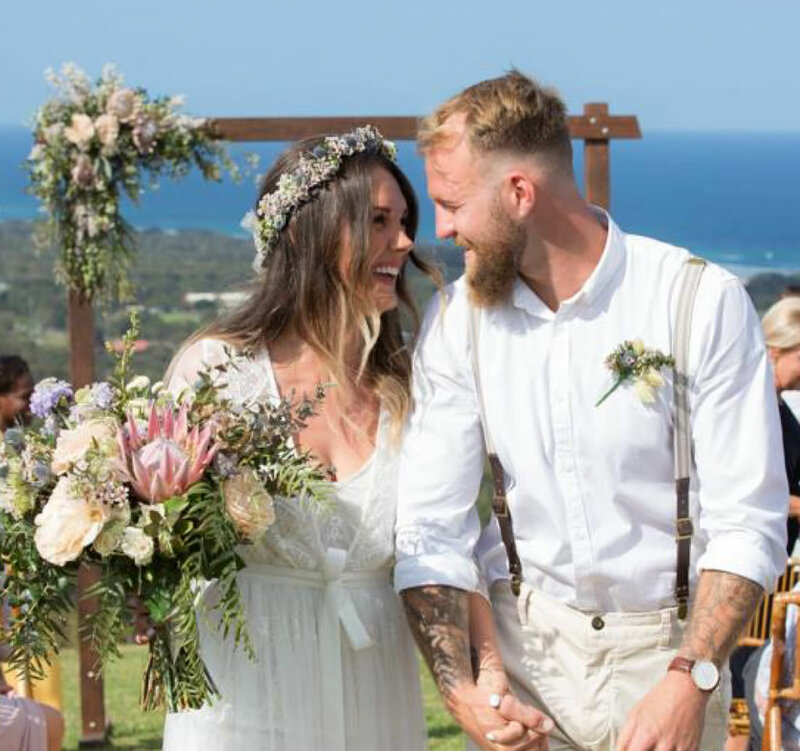 This popular Lennox Head Wedding Celebrant is a 5th generation local so she knows the Northern Rivers people and the territory. For any bride and groom to have an inside contact is a gift. 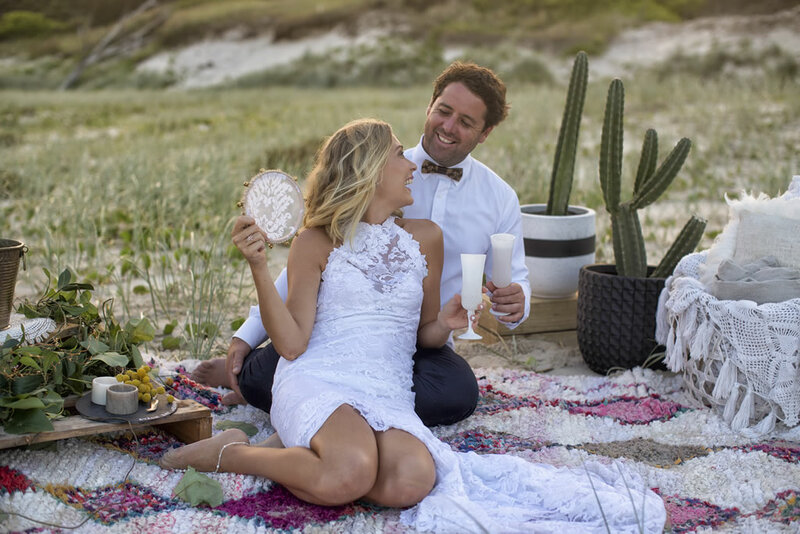 Jacqui is fit, energetic and a full time celebrant in Lennox Head so is able to spend lots of time getting to know each couples and their love journey. 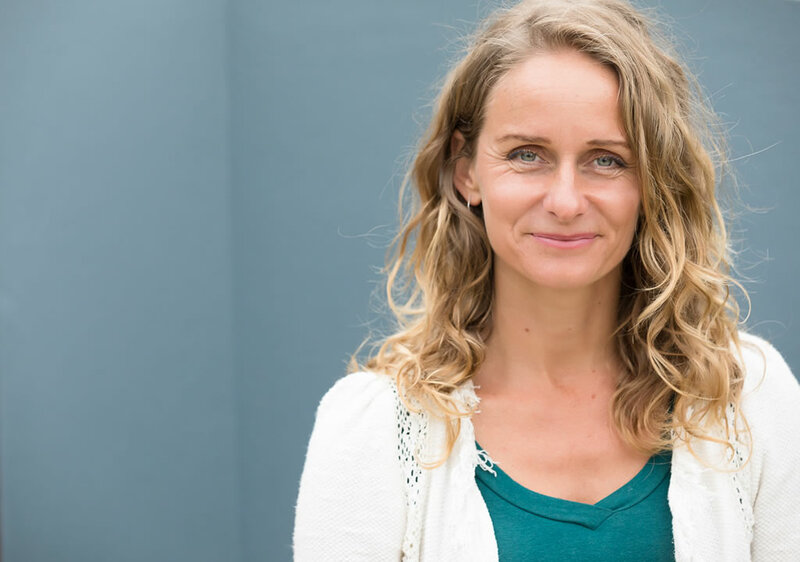 Enjoy collaborating with Jacqui who will then produce your bespoke ceremony content. Working together ensures a seamless but unique ceremony making it totally you. 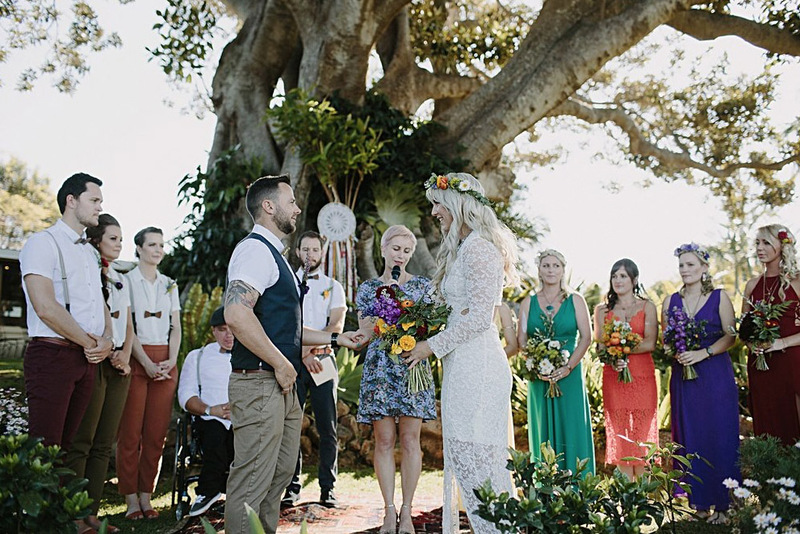 Jacqui's delivery is so engaging and she loves to take the ceremony to a new level of awesome. 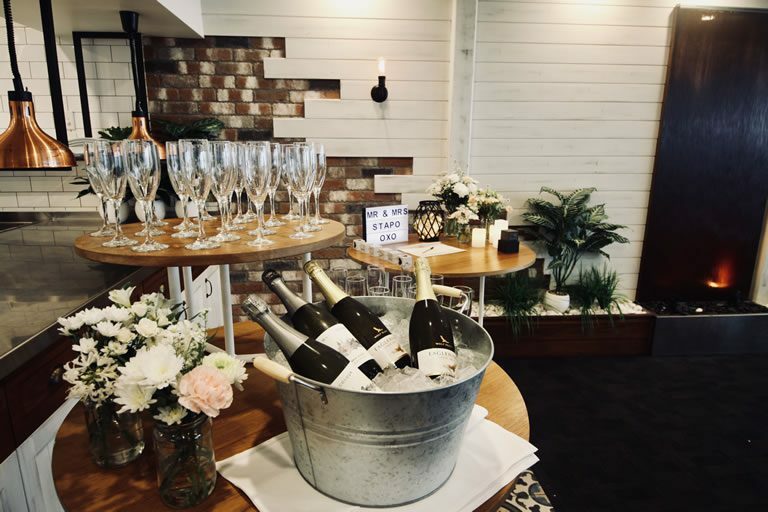 Have a look at the myriad of upbeat testimonials on the Champagne Celebrant website to hear what others say about their experience with Jacqui. 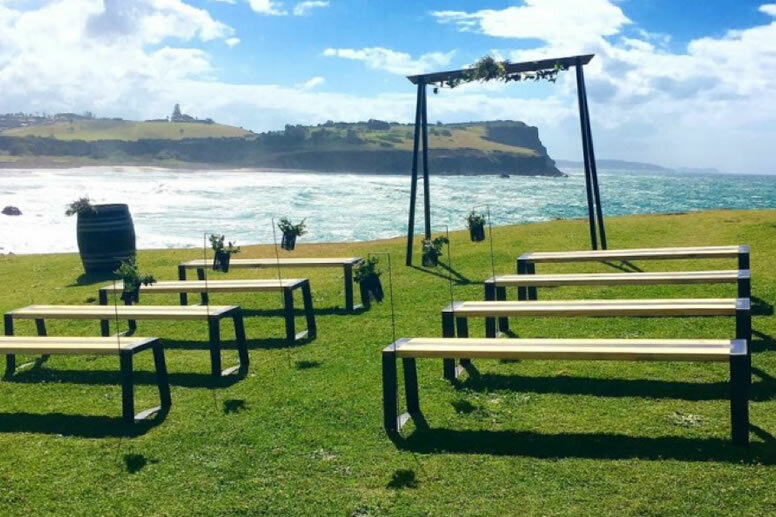 Jacqui recommends Lennox Head to anyone looking for that idyllic wedding setting. 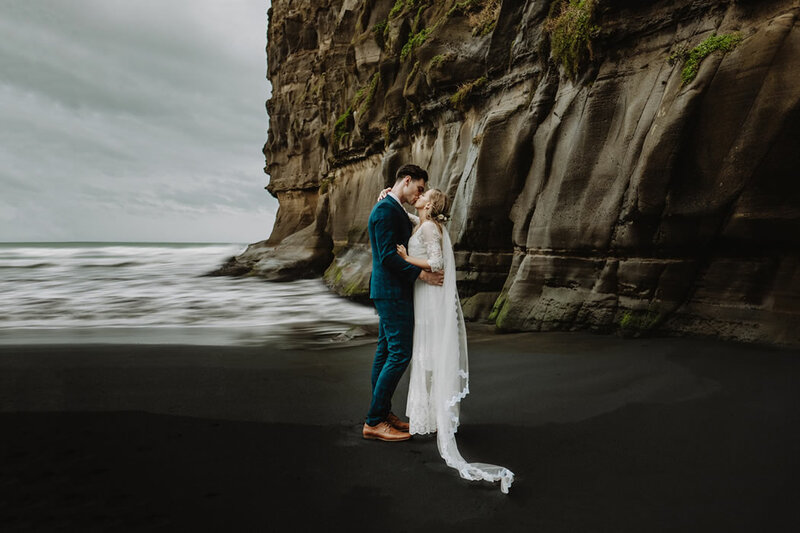 There are so many picturesque backdrops if you are looking to do it outdoors and Seven Mile Weddings for receptions, wet weather plans or indoor weddings. 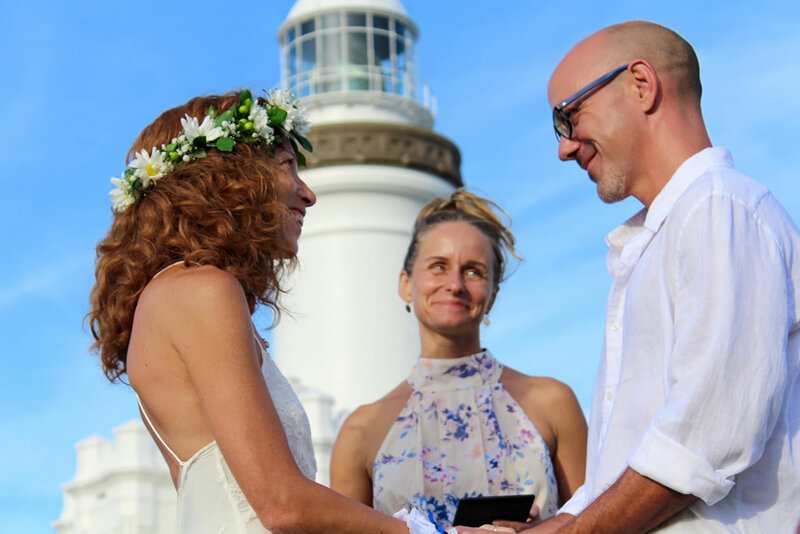 Byron Bay Marriage Celebrant, Susie Figgis, offers a relaxed, modern and fun ceremonies delivered with authenticity and humor. Your wedding ceremony is going to be a very precious moment in your life. My job and my passion is to help create a beautiful relaxed and romantic ceremony that feels aligned with you as a couple. Personal, customised and perfectly you. Working with me, everyone at your wedding will enjoy the meaningful expression of your love story, which will be delivered with warmth reverence and fun (at the right moments). Getting married is a super charged moment to face the one you love, celebrate and fully embody the beauty of your love story. It’s about your commitment to love, life and togetherness… whatever it is that it means to you. 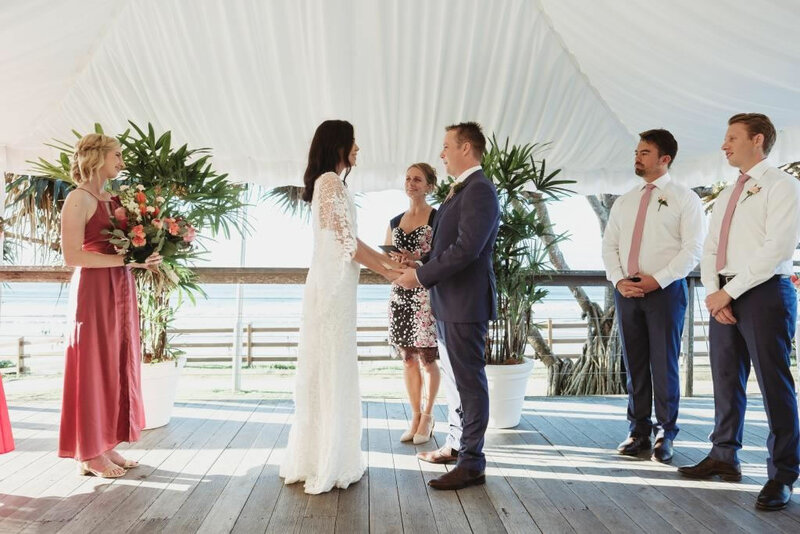 One of the things I love about being a celebrant is transforming your ideas, love story and inspirations into an unforgettable ceremony experience. 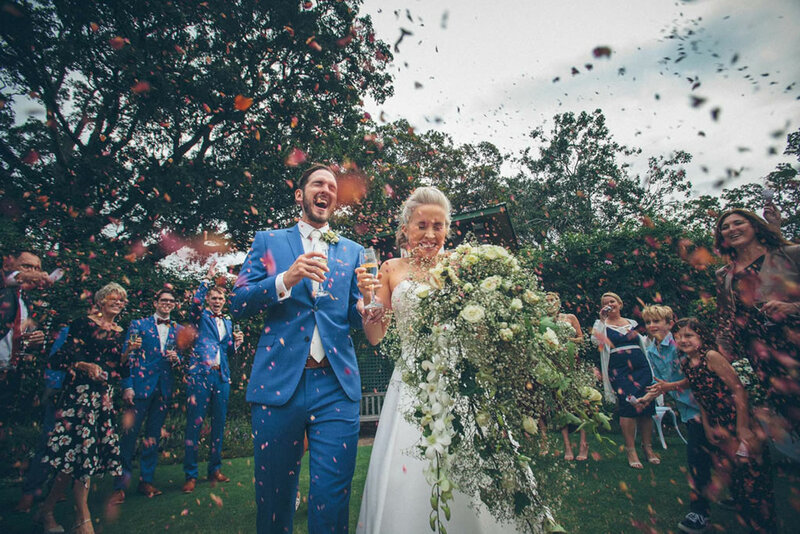 In the process of creating your perfect ceremony, we will also include a healthy splash of your truth and beliefs, and the quirky reality of your relationship so that everyone there, especially you, will feel that your ceremony is a true representation of you. 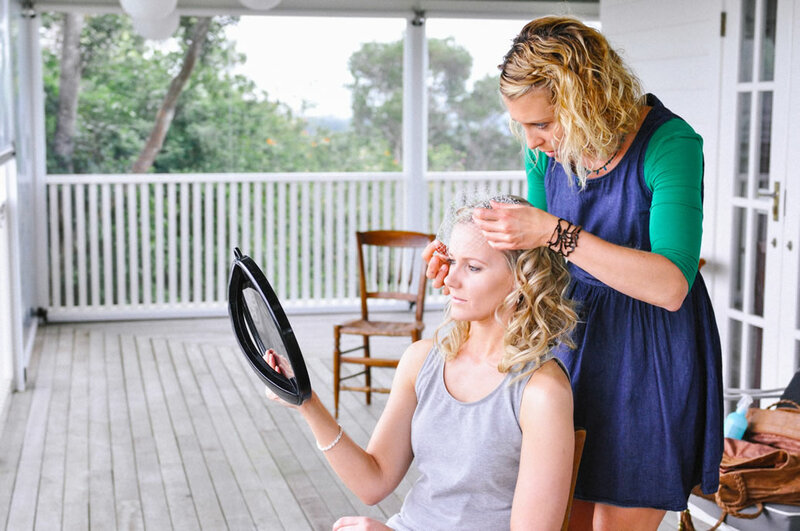 A mobile make-up artist in the Lennox-Byron region offering a high quality and highly professional service. With twelve years experience, studying and working with big names and brands, including M.A.C Cosmetics in Sydney - where she learnt from the best of the best in the industry. Ashley has the knowledge and skills to suit and enhance your individual style, to help create the perfect look for you. Ranges of styles include bohemian, vintage, Hollywood glamour, classic, natural or a summery-beach look. She uses a collection of products by reputable brands to not only ensure that you have a fresh, flawless look, but also to last the duration of your special day. Ashley provides a friendly, warm experience to guarantee that you are able to enjoy your special day to the fullest. Understanding that time is of the essence, she can meet you at your location for your convenience. She offers a service that is un-invasive, time efficient, and effective. 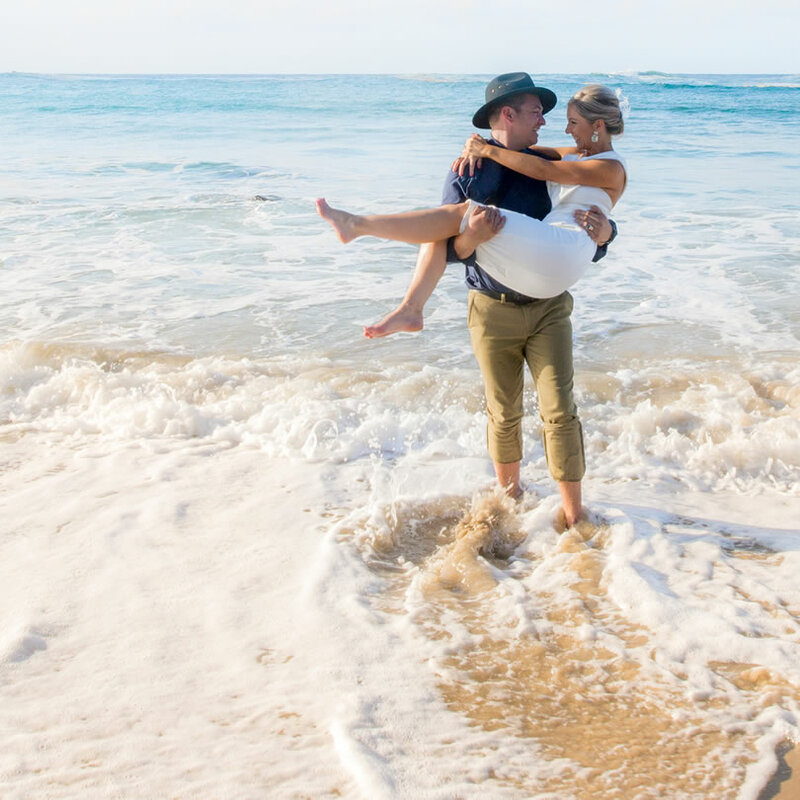 Ashley recommends that you book a trial with her so she can get to know you, your style, and your vision for the perfect Lennox-Byron wedding. 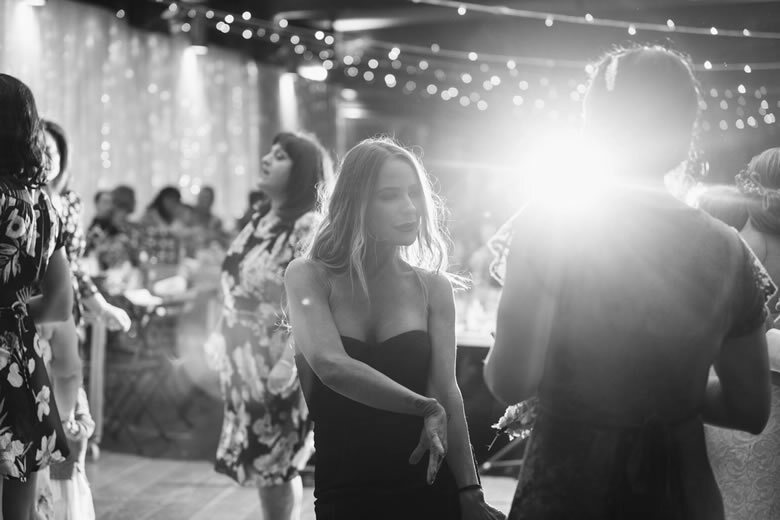 Most weddings have a photographer, but what happens when the photographer leaves just as the party is getting started? We have just the solution- a photo booth! As a guest at a wedding, we are sometimes lucky to know most of the people there however quite often we don’t. 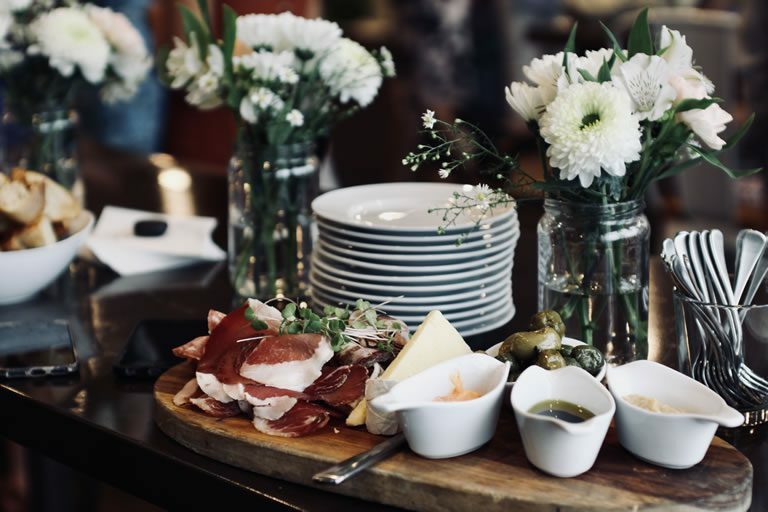 Jo, our Seven Mile functions coordinator, saw an opportunity to bring guests together through good times and laughter with take-home pictures to serve as mementos of your special occasion. 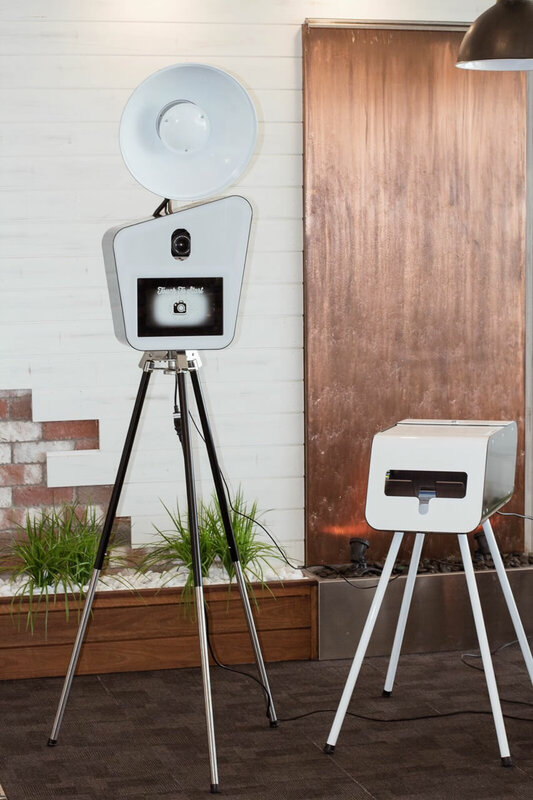 Flashbacks is a light weight, retro style open air photo booth that will capture those unforgettable moments that both you and your guests will cherish for years to come. The studio quality lighting and DLSR camera will ensure you leave with clean and crisp images and our equipment will be set up and packed away for you leaving you free to attend to other important aspects of your special day. Your one stop shop for furniture, prop and décor hire, also offering professional stylist services. 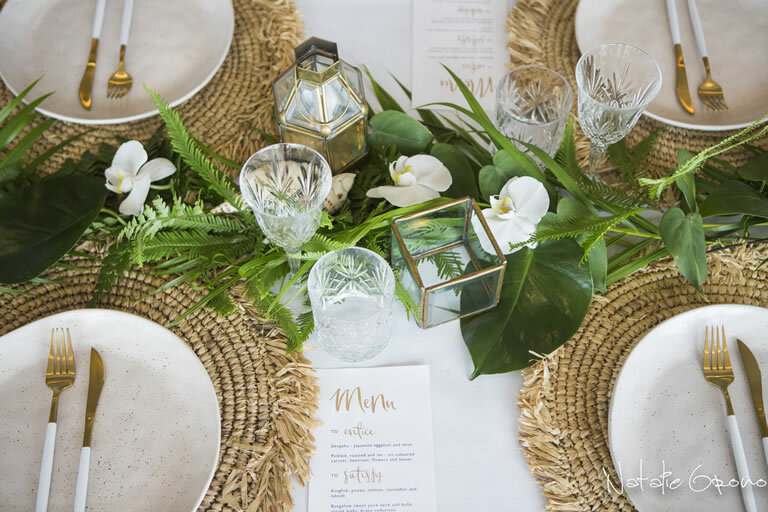 From Tropical Luxe to Coastal Romance, the team at the Wedding Shed showcase leading international trends in design excellence and wedding functionality. Let us help you style the wedding of your dreams. 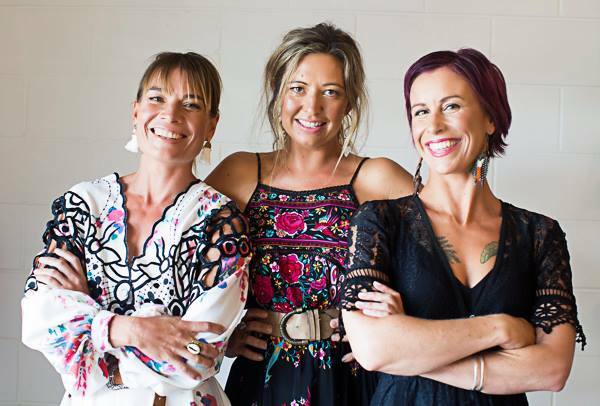 Byron Bay’s leading style gurus. 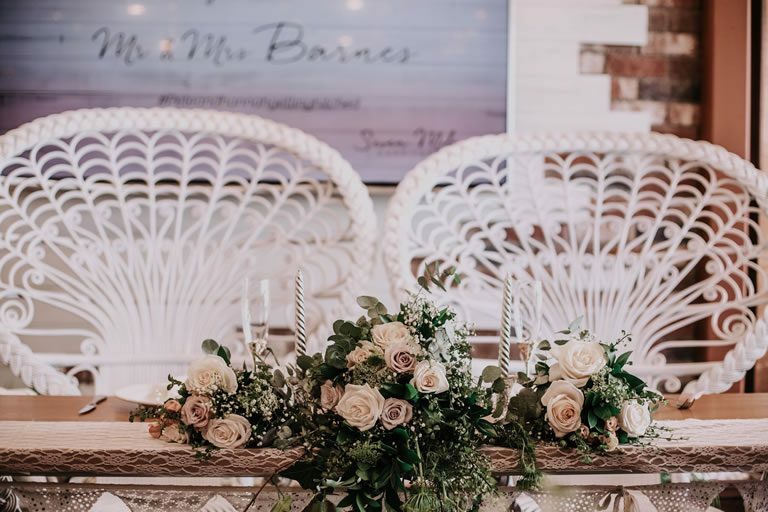 Perfectly combining beautiful aesthetics with functionality, the team behind The Wedding Shed showcase looks that divinely compliment our coastal setting. Select your theme and “ shop the look” or create your own wish list and hand select your favourite pieces. 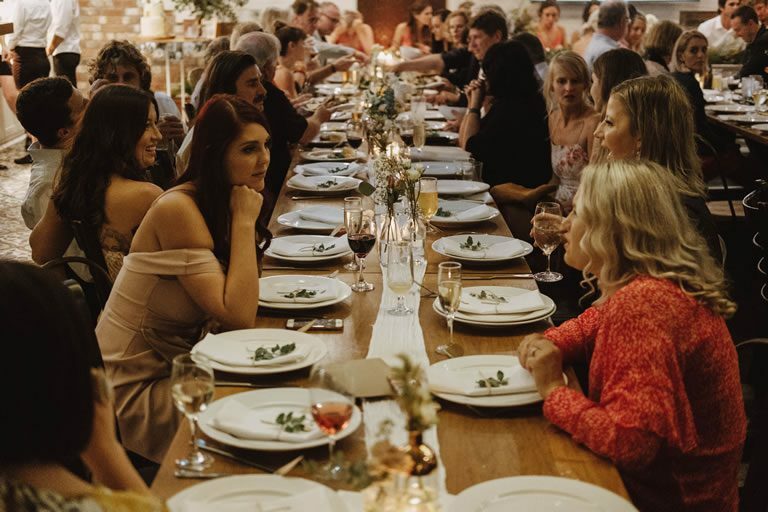 The Wedding Shed caters for your entire wedding styling journey at Seven Mile Weddings, creating a bespoke experience from detailed table scapes, to styled cocktail and reception space. Each occasion promises to reflect you and your partners personal taste, creating the perfect atmosphere for your guests and wedding photos. 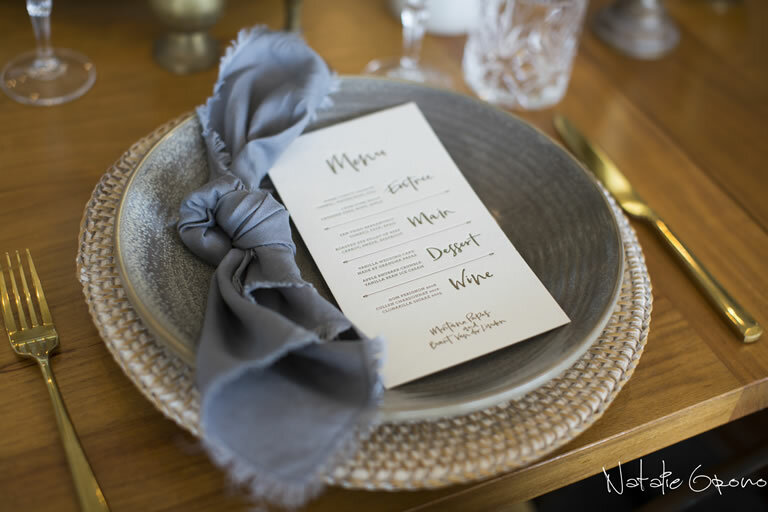 It’s all about the details … with our ever expanding range of style pieces we have everything you need to beautifully appoint and gesture every aspect of your special day. So what if styling a wedding doesn’t come second nature to you? 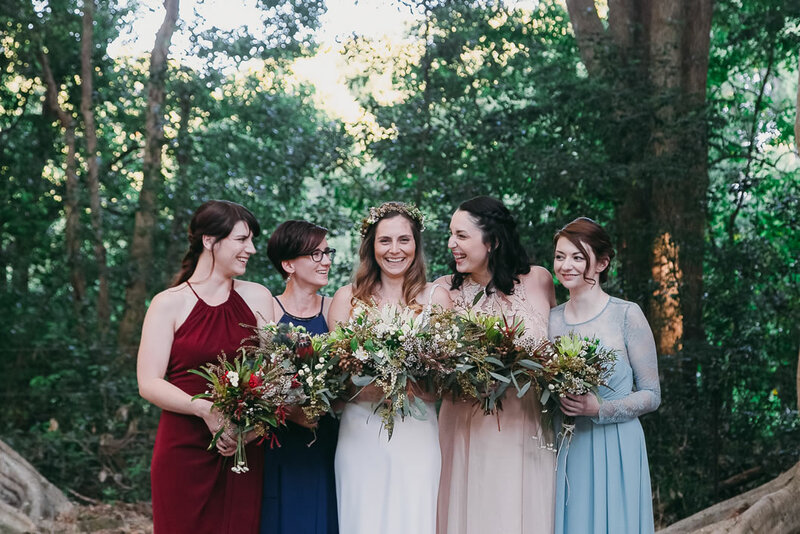 No need to stress, as you have the choice to utilise the wildly talented expertise of The Wedding Shed stylists to help you select your style pieces. 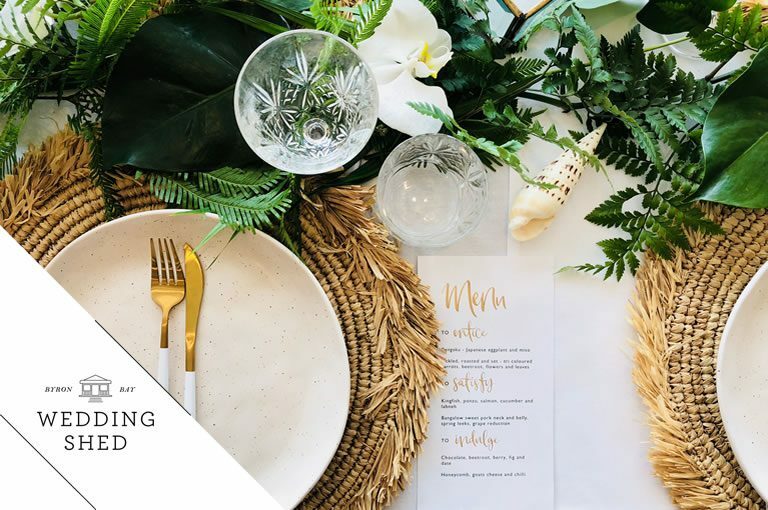 Rest assured this team know exactly how to create any styled theme If your budget allows take it one step further and hire a stylist to be there and set up on the day. Feeling excited to take the first step towards creating your ultimate wedding day? We can’t wait to hear your ideas, share your inspiration and play a part in bringing it all to life. 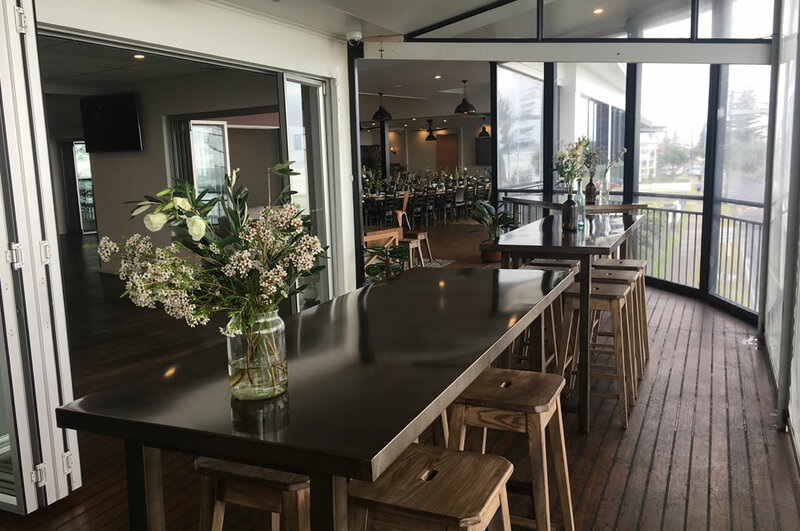 Florentina Flowers in Lennox Head has been creating beautiful fresh flower arrangements for over eight years. 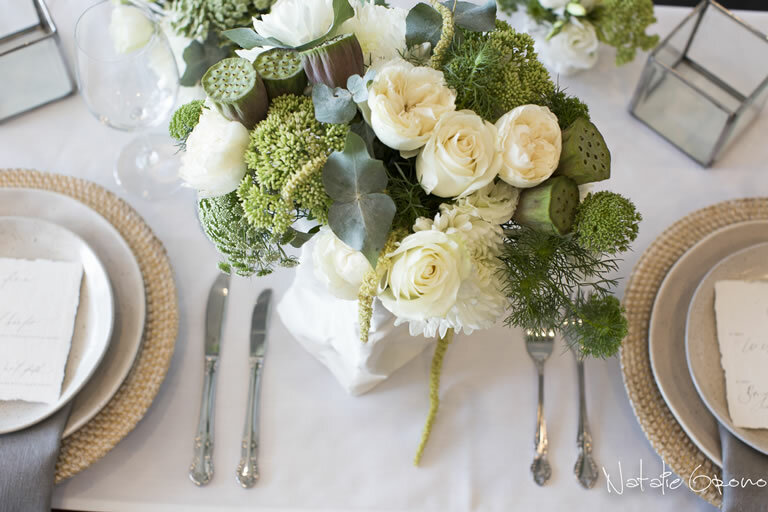 We pride ourselves on delivering quality floral arrangements for every romantic wedding. 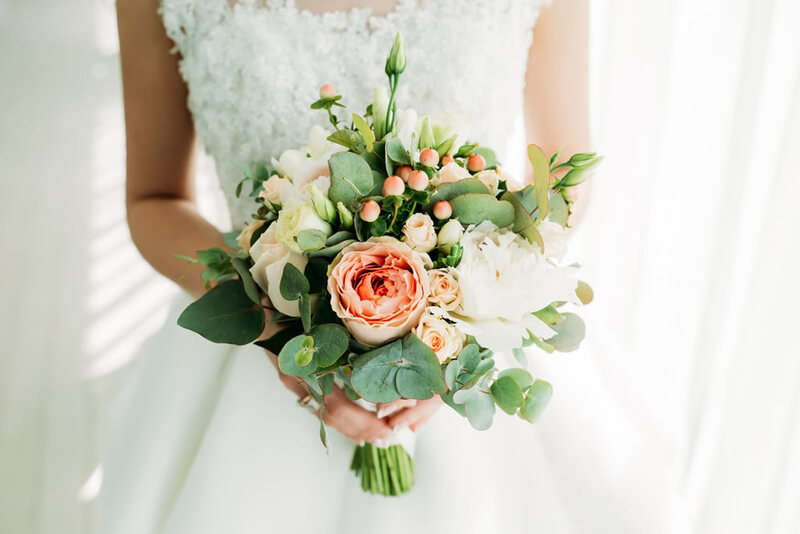 We hand select from a large variety of only the freshest, premium quality flowers for your special day including wedding centrepieces, general wedding flower arrangements for the ceremony and venue, wedding bouquets and seasonal wedding flowers. Our qualified florists are experienced at making dream weddings come to life. 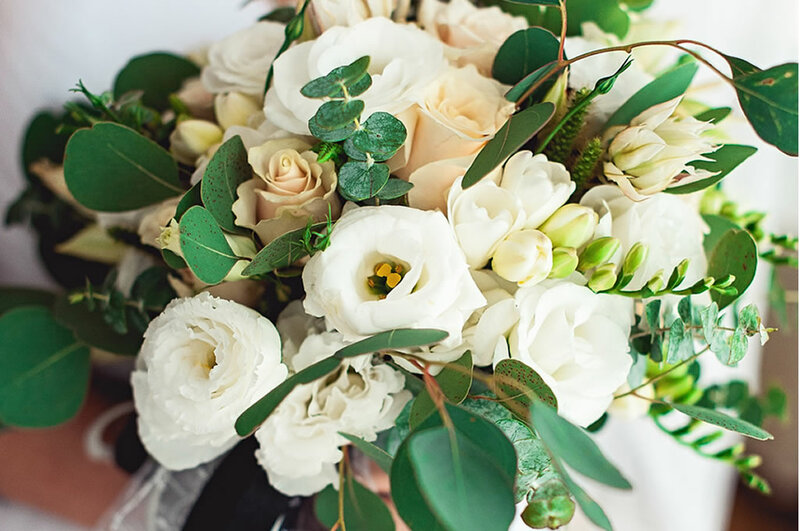 Visit our wedding gallery https://www.florentinaflowers.com.au/Wedding-Flowers for inspiration and submit an enquiry form for more information. Or drop in to see us personally. We believe your wedding day is one of the most important days in your life and we're here to guide you with inspirational ideas and creative designs. 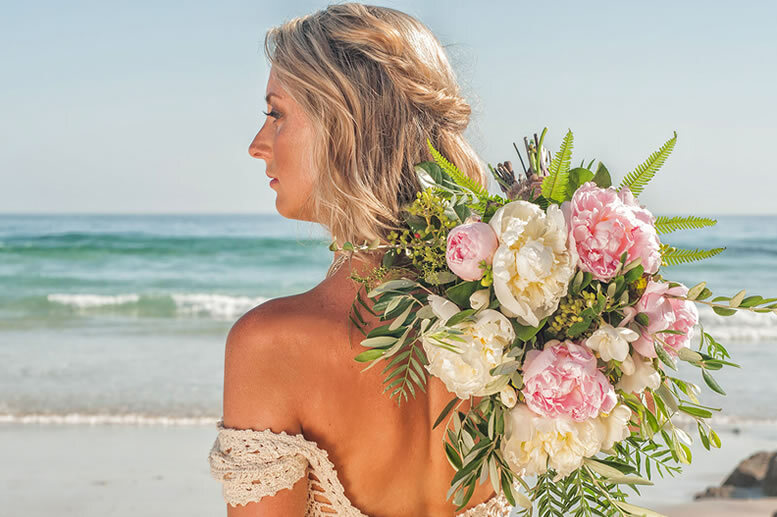 We pay special attention to the needs and expectations of the bride by providing the perfect setting arrangements to compliment your style, whether it be a traditional wedding, on the beach, Boho style or your own unique request. Come and talk to us today and let us help you create an unforgettable wedding ceremony. 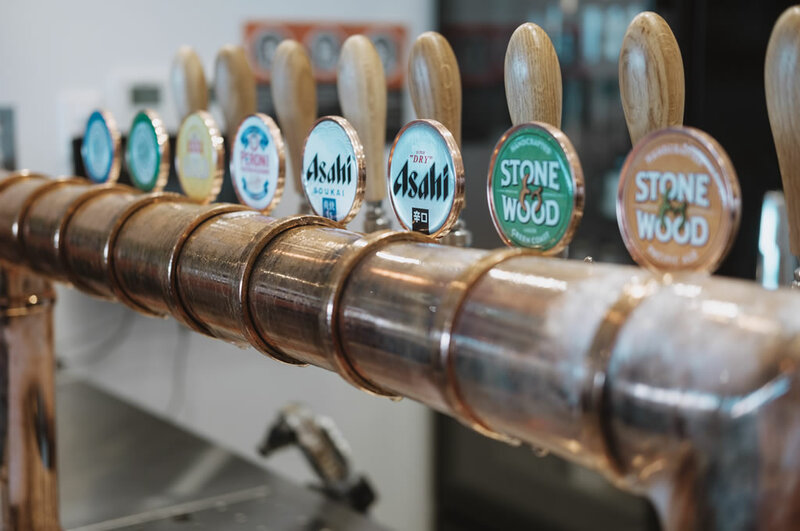 Same day delivery Mon-Fri to Lennox Head, Ballina, Byron Bay, Lismore and surrounding areas and interstate. 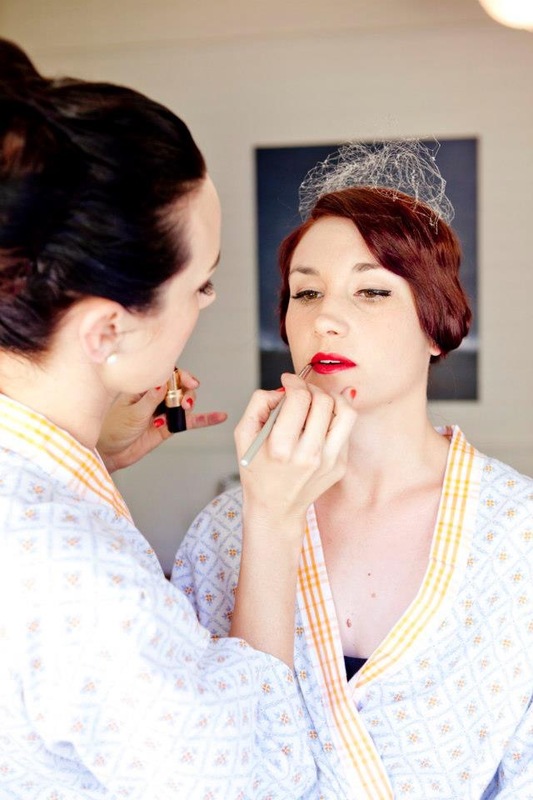 Be your best bride with Red Ren's Hair & Makeup. 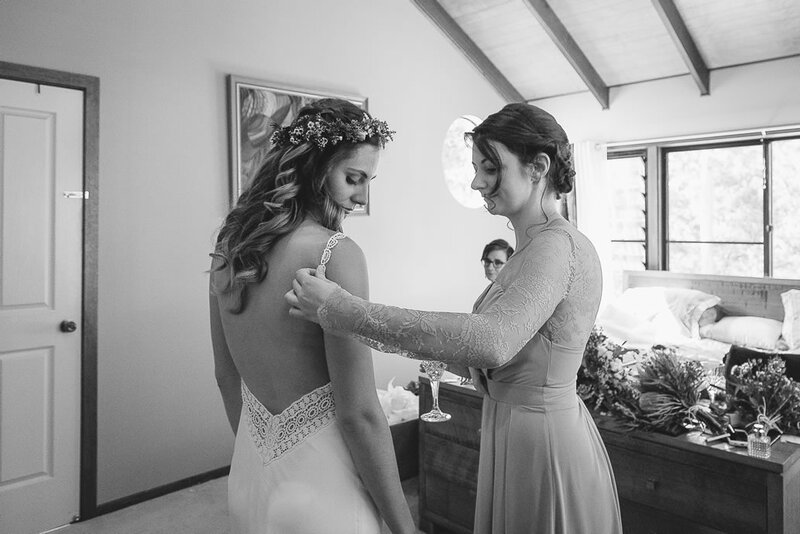 Experienced, professional hair and makeup artist with over 15 years experience and a long list of happy brides. 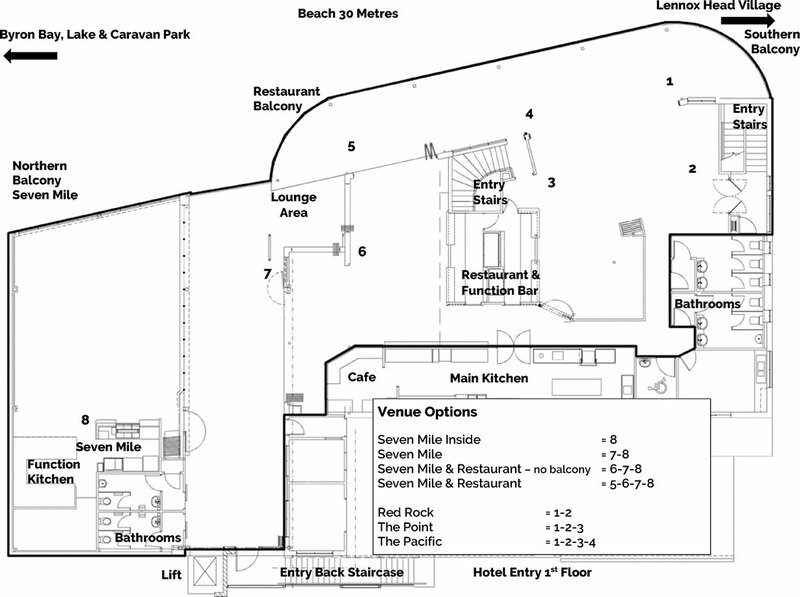 Based right here in beautiful Lennox Head and able to travel to you anywhere within a 40km radius. 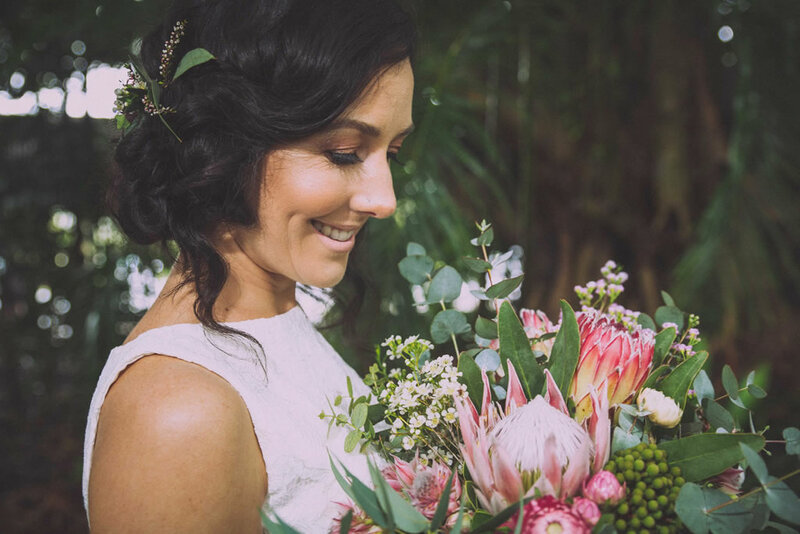 Ren is a highly skilled, passionate and versatile wedding stylist with a focus on keeping up to date with latest hair and makeup trends and using only the best high quality products. Whether you're a classic, simple, elegant bride. A beachy boho bride. Edgy or full glam, Ren will help you achieve the beautiful results you desire for your big day. Ren is also a vintage hair and makeup specialist! And being a fully qualified hairdresser we can even help you with your hair colour and cut needs in the lead up to the wedding if you wish. Consultations and trials are very welcome. 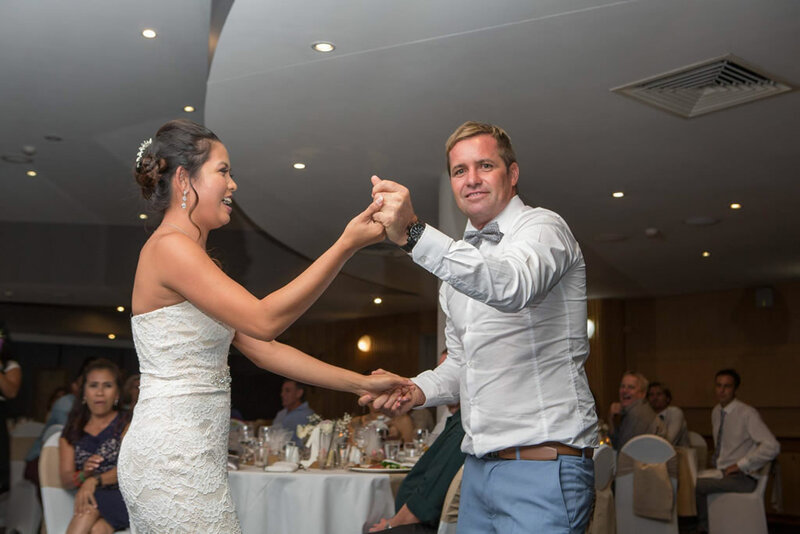 More than just a wedding DJ, Max has the maturity, experience & confidence to MC your special day making it memorable for all the right reasons. Max started DJing as a teenager and also has 20 years experience as a major events director and MC. 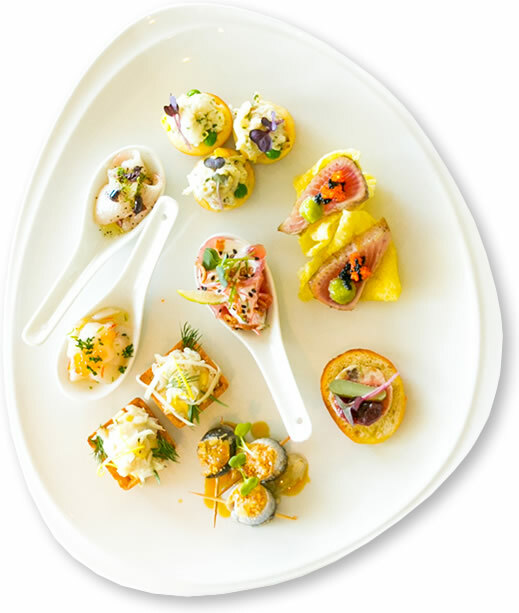 He is based in Lennox Head just South of Byron Bay and services the Northern Rivers region. He appreciates that careful planning and preparation along with individual consultation are the keys to success with any event. 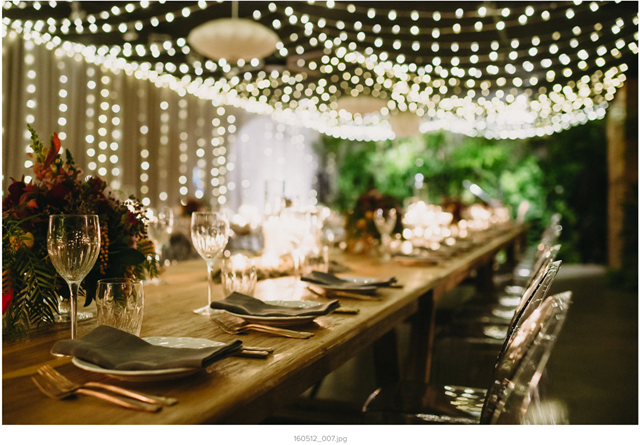 All weddings are unique and vary greatly with the venue chosen, theme, age of the couple and the mood that the couple want to set for the occasion. 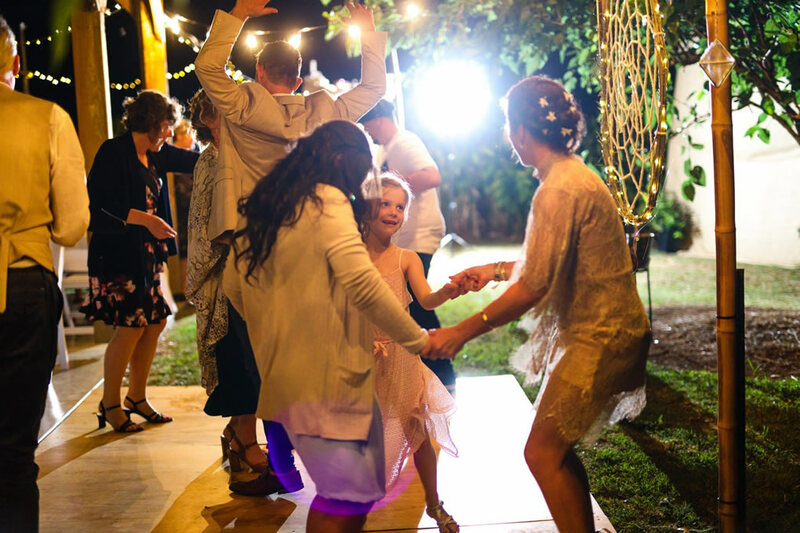 Max will personally meet with the couple and/or their wedding planner to ensure that any special requirements can be arranged for your wedding including what selection of music that you would like your wedding DJ to play. 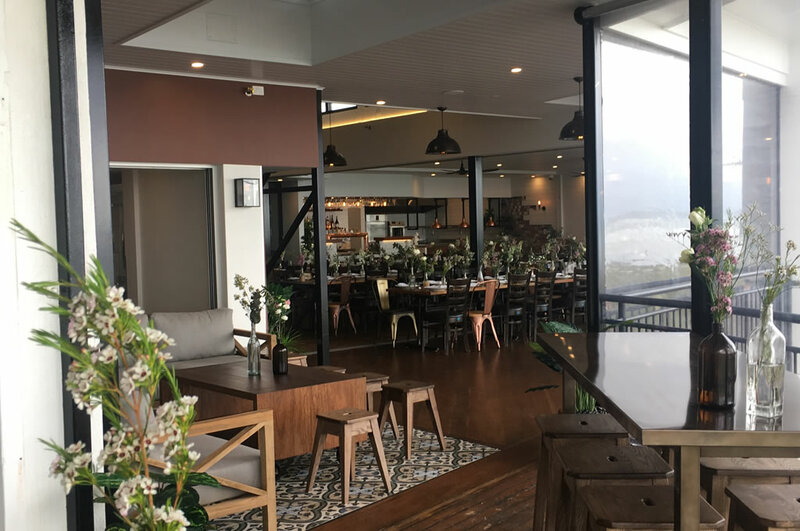 Max has performed as a DJ at popular venues such as the Byron Bay Beach Hotel to large crowds and has also worked at small intimate private parties. He has performed as a wedding DJ & MC, 21st's to 60th's and everything in-between along with specialty functions such as 100% vinyl nights. Max has an appreciation for all styles and eras of music, packing a wide range of tunes including a large vinyl record collection to dig into. Living just up the road from Byron Bay he is inspired by the many international DJ’s that come to Byron Bay to perform. He realises that everyone has different tastes in music and is experienced at playing a wide range of music genres for various audiences. The equipment Max uses is all of a professional standard. Eco friendly LED lighting for the dance floor is standard with any wedding package. 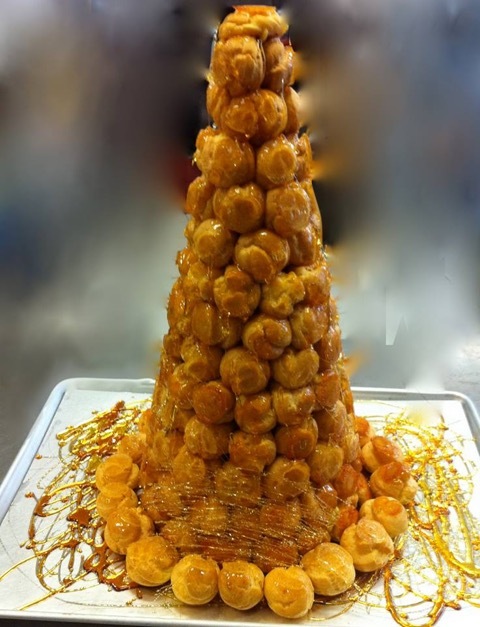 Choux Choux Patisserie is a well-established French/Australian Bakery serving quality tasty treats. Food with Heart created with love & real ingredients. 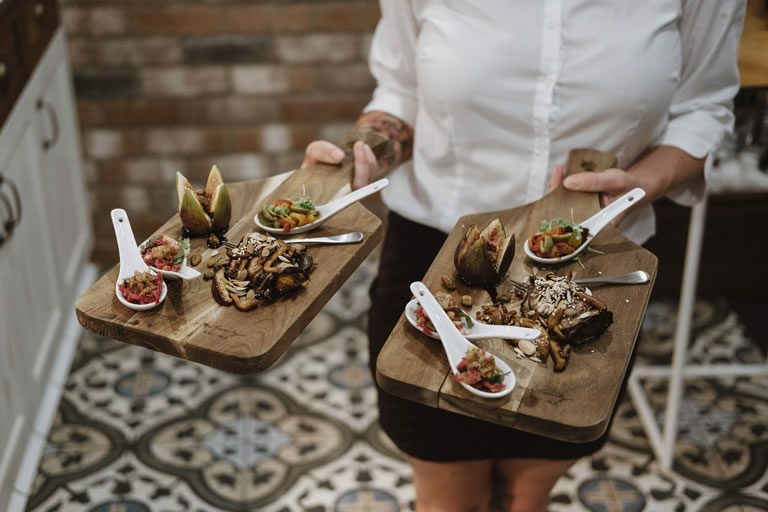 Let us help you celebrate life whether it is a birthday, wedding, anniversary or reunion whatever the celebration we have the delicious treat that will leave your guests wanting more. Our cakes are all about the delicate balance of flavours whilst looking delicious to the eyes. 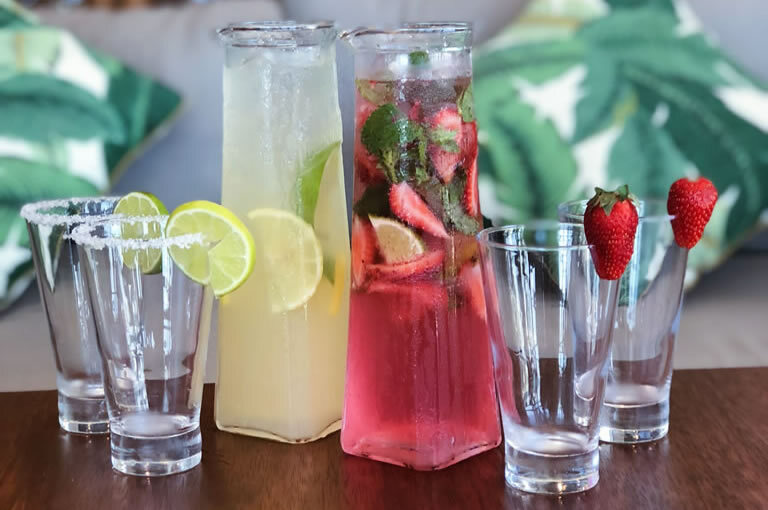 Treat yourself family & friends, after enjoying the divine view & food of 7 miles weddings divine venue, to a delicious creation delivered and ready to enjoy at the peak of your celebration. 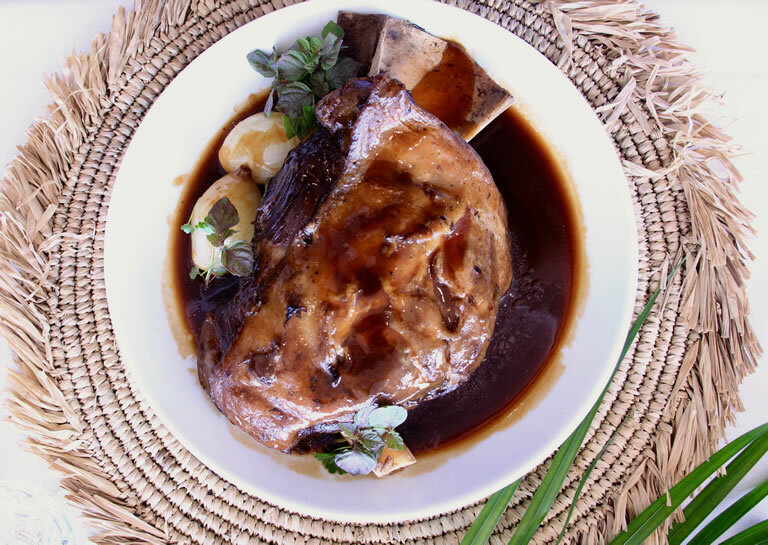 Our motto is ‘ Food with heart’ made with love created by our French pastry chef hassle free for you to enjoy. I'm equal parts picture taker and filmmaker and 100% story teller. I had a bit of a gypsy upbringing but I have always called the NSW northern rivers home. Most of my youth was spent surfing from Angourie to Double Island Point and I know these coastlines and nearby hinterlands intimately. I still explore these areas with my daughter and am always searching for new places so my couples have original, memorable images. After years filming lots of documentaries all over the world it made perfect sense for me to transition my skill set into wedding photography and film making. Once I began shooting weddings more regularly, I became more and more aware of what an incredible privilege it is to be witnessing such celebration, such devotion, and such emotion as regularly as I do. It is truly the greatest honour to photograph two best friends, surrounded by their most cherished loved ones, on the happiest day of their lives. Outside of weddings, when I'm not with my family, you can find me bobbing around in the ocean, usually with a camera in my hands. 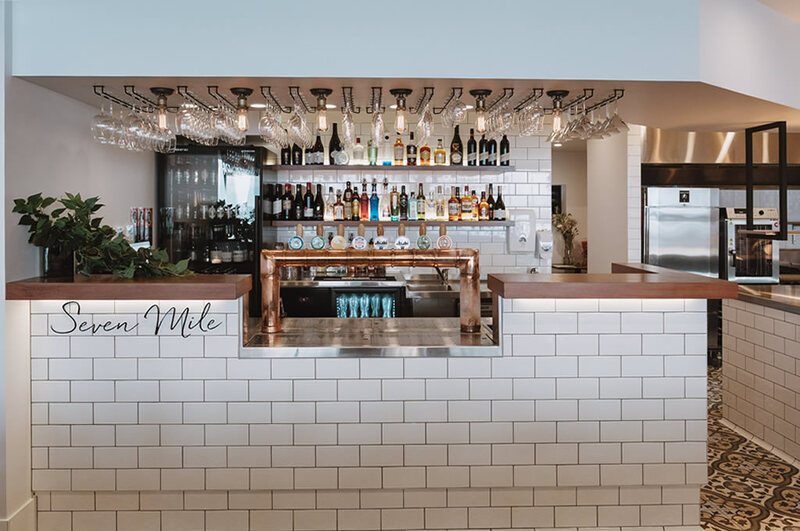 As I said earlier, first and foremost, I'm a storyteller, have a chat with the team at Seven Mile Weddings about my work and style, if you want to see more of my work, pop over to my site by clicking on the link below. If something resonates with you, please get in touch. I'd love to be there on your big day to tell your story. 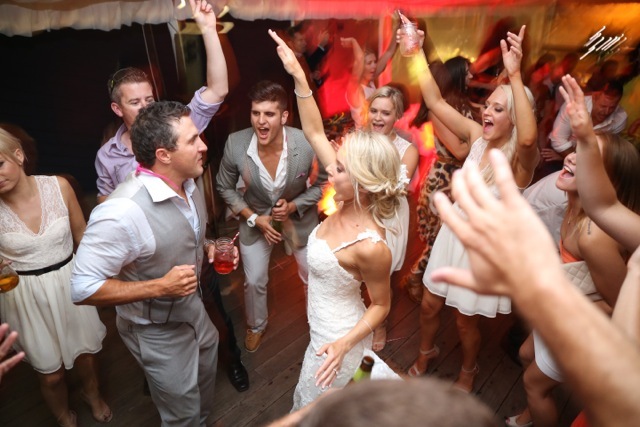 Coastal Beats DJs are wedding DJ specialists always going above and beyond your expectations to help create the perfect atmosphere. No two couples or weddings are the same and our aim is to provide each and every couple with a personalised and unique experience. 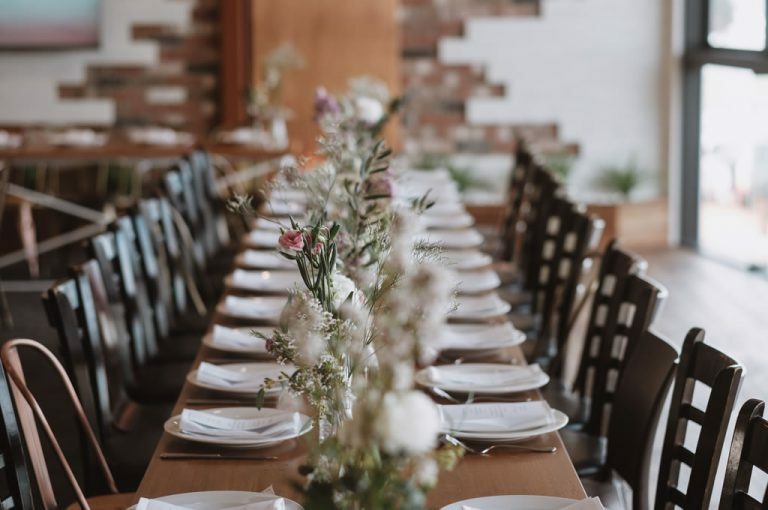 We treat every wedding as if it was our very own and pay attention to every detail to ensure you and your guests have the best experience possible. This is shown by our 5-star client reviews and referrals by both existing clients and wedding vendors. 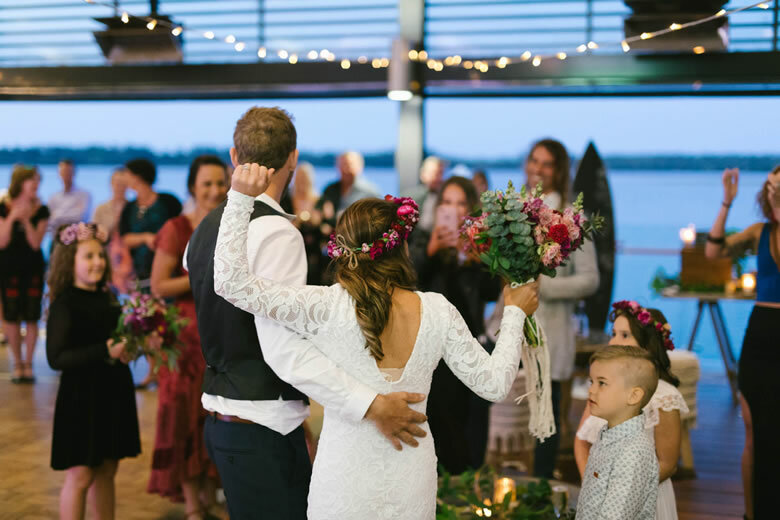 As your wedding DJ, we will work with you to plan and prepare as much as possible to ensure we provide a first class experience for you and your guests, leaving you to enjoy the day as we look after all the details. Planning is made easy with our online portal giving you access to all planning forms our music selector with over 89,000 songs and the secure payment portal where we accept all major credit cards. Congratulations on your decision to get married and have a north coast wedding! And Hooray for finding seven-mile weddings! 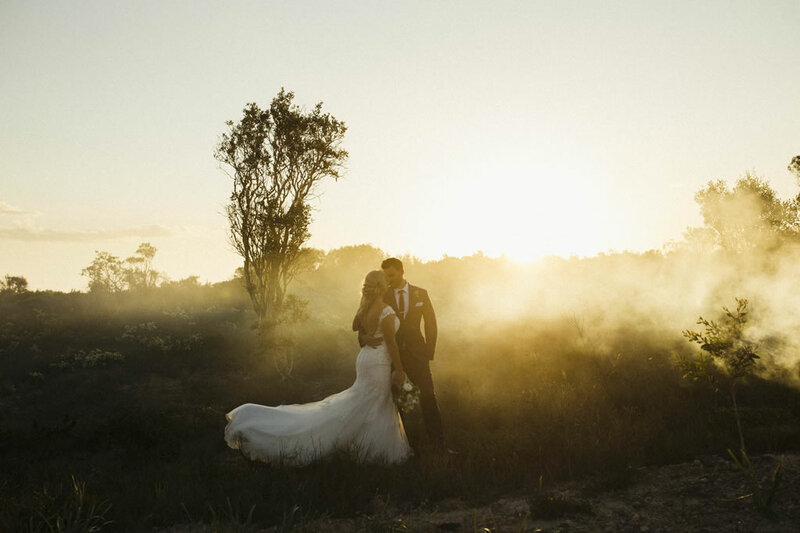 As a local Lennox Head wedding photographer I couldn’t think of a more perfect setting to celebrate your love story with friends and family. I offer heartfelt storytelling, wedding photography that will capture and preserve the magic and atmosphere of your special day forever. With an abundance of local knowledge I will make sure I find you your perfect dream photo locations while we have a delightfully good time doing so. 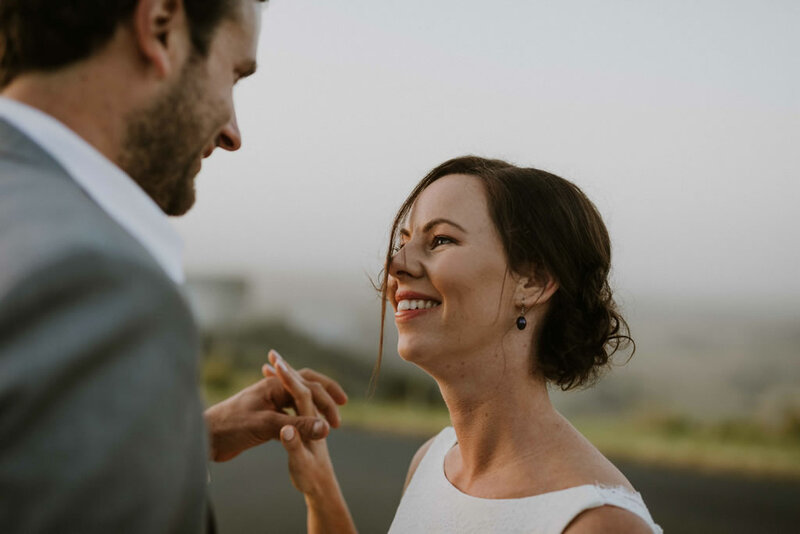 Let me introduce myself, my name is Natalie and I am lucky enough to call this lovely part of the world home I love life and love a good love story hence my role as a wedding photographer! Since picking up my first camera many moons ago I am blessed to have pursued a wonderful career in something I am so passionate about. Photography has journeyed me to breathtaking places and led me to meet countless fantastic humans. With a background in photojournalism and fine art photography I approach each wedding with a unique and attentive aptitude to capture the beautiful flow of your magic day. My style is documentary storytelling with a creative edge. Happily I can tell you that I am a multi award-winning photographer and that my relaxed, reliable and experienced approach earns me a respected reputation. I sincerely love my job and I love to celebrate your pure joy by creating wonderful memories for you to share forever. 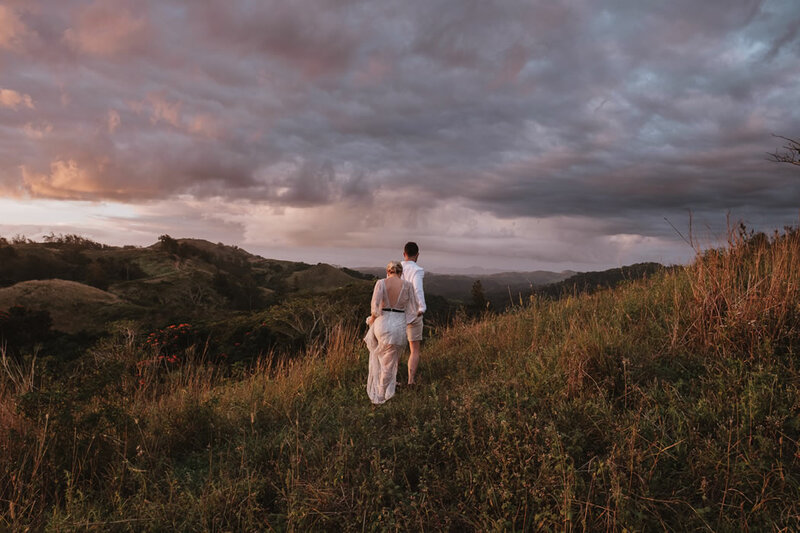 I offer customised wedding photography packages tailored for your needs and as a Byron Bay wedding photographer I get to capture your love story in ridiculously romantic settings and have an abundance of local knowledge to offer for your perfect dream photo location. 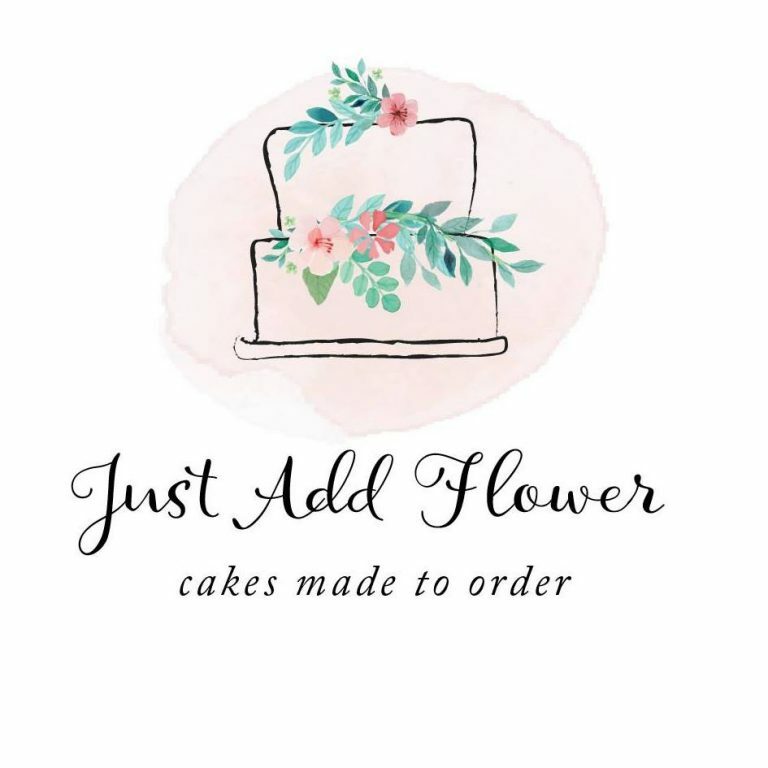 Just Add Flower began when Kristin Hilton’s passion for baking and decorating transformed into a business. It all started baking cakes for family and friends and after a lot of encouragement from people around her she took the leap and started her home business and hasn’t looked back. 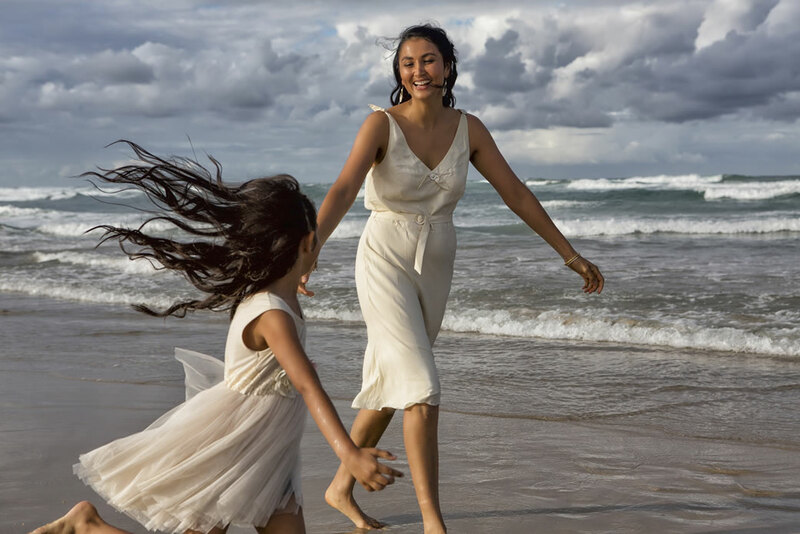 She is a local Lennox Head mother of three young girls, juggling a busy family life. 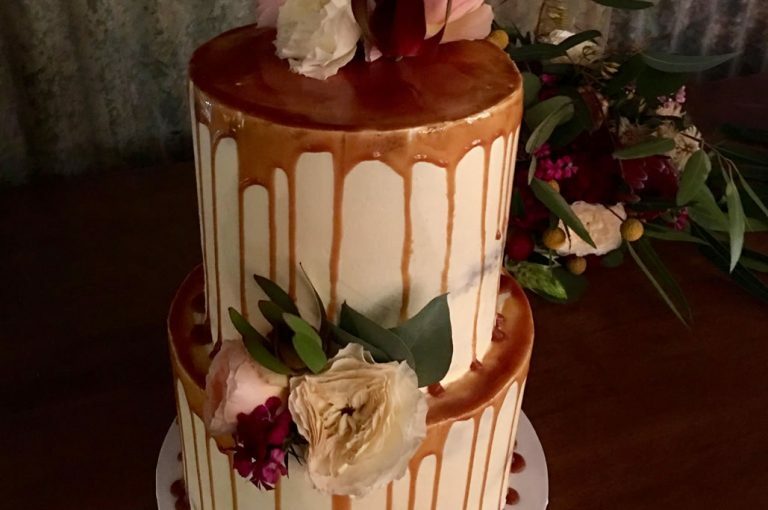 Whether it’s a one, two or three tier cake she can work with you to create your dream wedding cake according to your personal preference of style, flavour and decoration. She can also cater to any special dietary requirements if necessary, whether its gluten free or dairy free she will work with you and any requests you might have. Her extensive flavour list is available upon request. If something isn’t listed she is happy to accommodate. 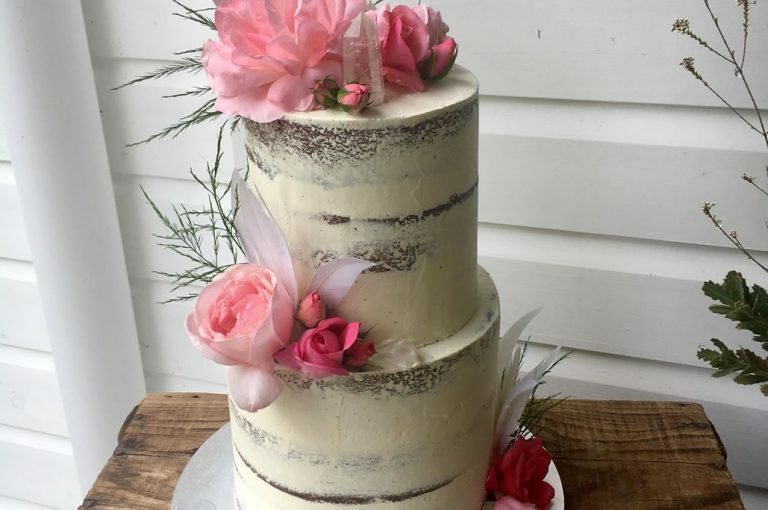 Kristin loves doing wedding cakes and her creations have been the focal point of many couples’ special and memorable day. Each cake is a ‘one off’ creation so each is special and unique. 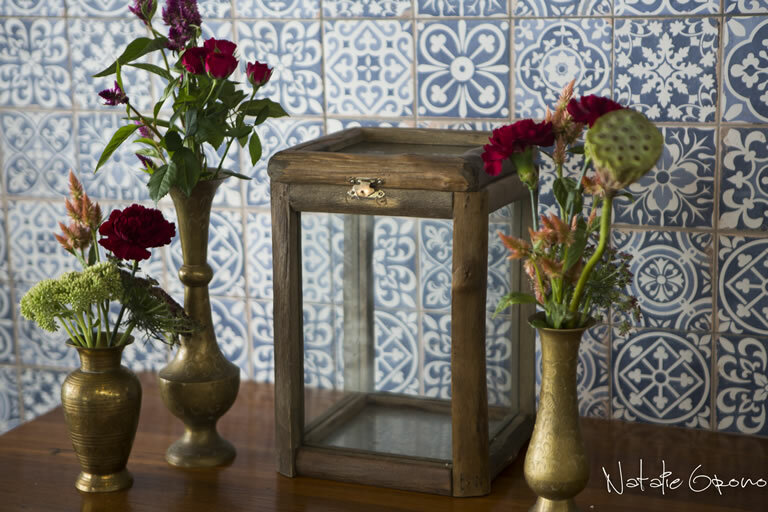 She collaborates with local florists to secure the freshest most beautiful flowers to decorate her work. 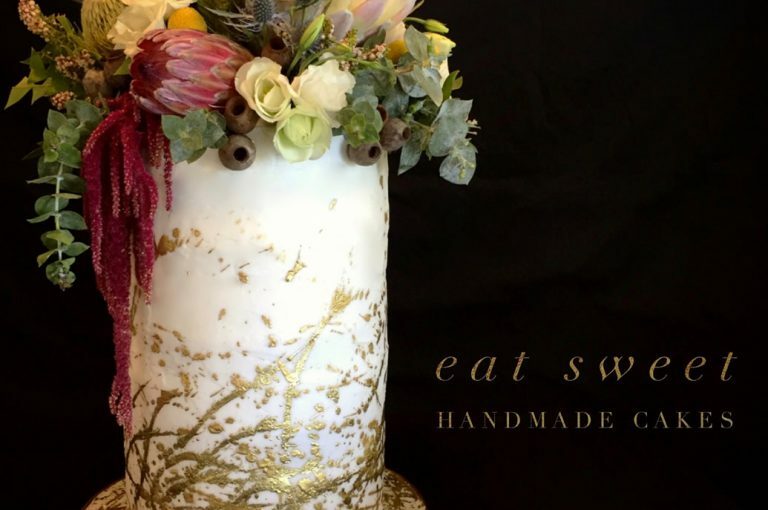 At Eat Sweet Handmade Cakes, we just love creating beautiful, bespoke wedding cakes, and we are deeply passionate about creating unique and delicious edible works of art. 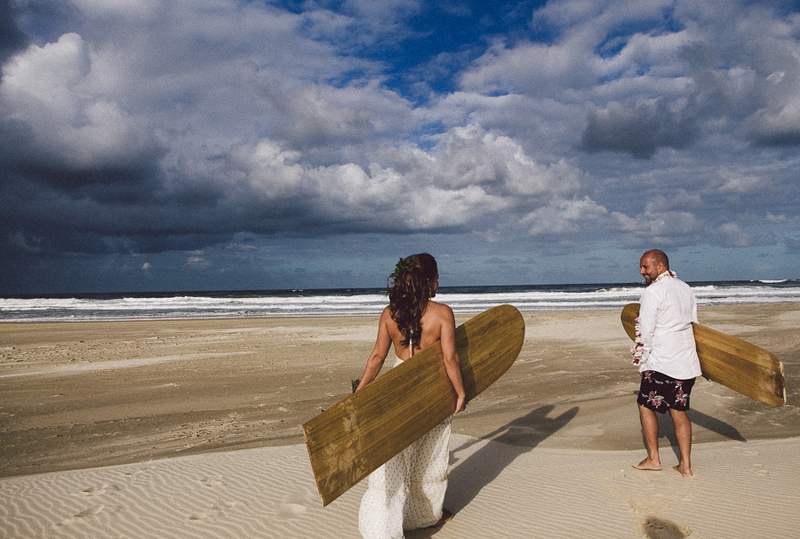 We constantly find inspiration in this beautiful part of the world and draw on the colour and freedom of the far north coast of New South Wales. This passion and love comes through in our exquisite cake designs. 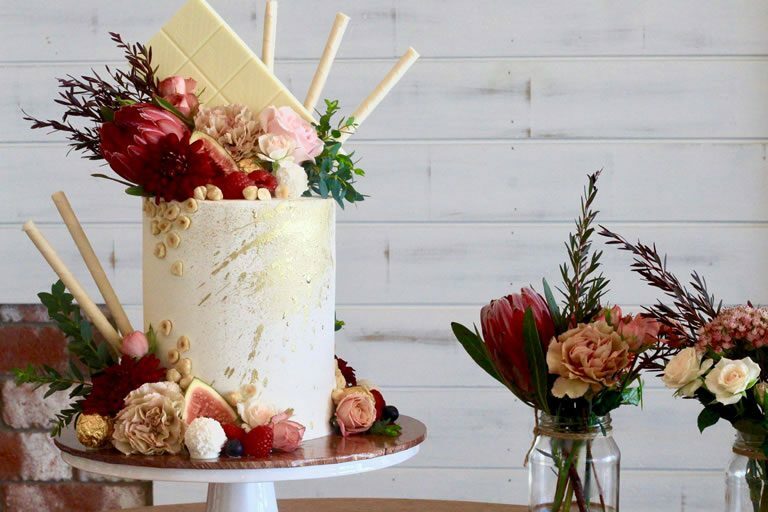 While planning your unforgettable day at Seven Mile Weddings in picturesque Lennox Head, Alexis will work closely with you to create an original wedding cake design for your special day. She loves designing, creating and expressing her passion through sophisticated, bespoke wedding cakes. Her stunning designs are all unique and individually hand crafted to complement your colour palette. 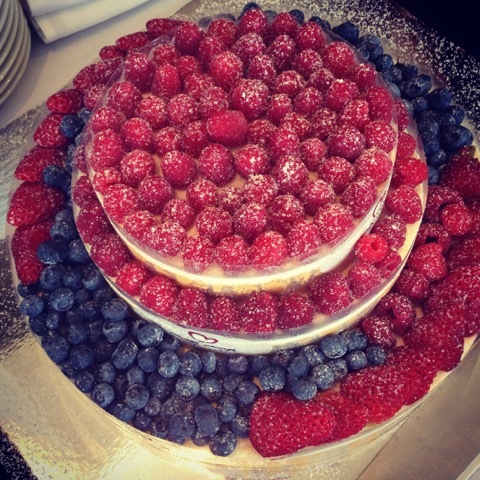 Distinctive, both in style and flavour, Alexis truly believes that your cake must taste as wonderful as it looks. As cutting the cake together, is one of the most memorable moments of the day, we will ensure that the joy of that moment is yours forever. A dream come true. Alexis’ handmade sugar flowers are truly stunning, and of course, each one unique. 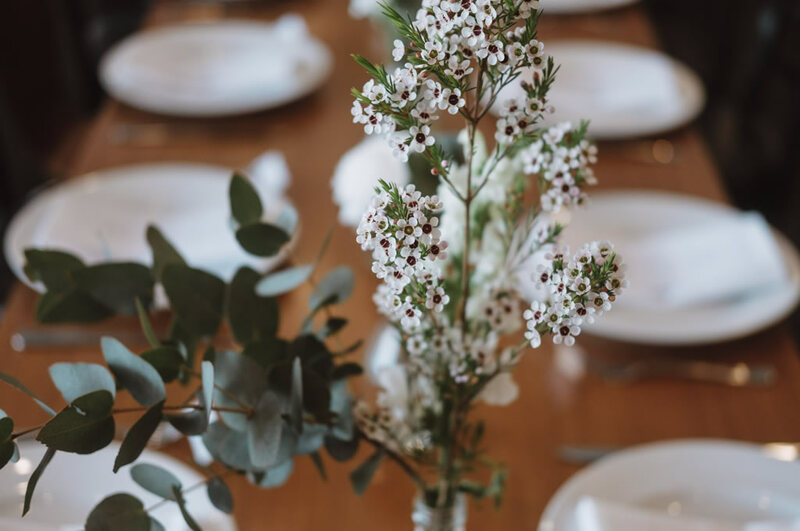 Fresh flowers are also a beautiful option, and we are very happy to work with your chosen floral designer, or draw from our local floral experts. Alexis is also well known for her handcrafted characters, which can add an element of fun to a bespoke cake design. We pride ourselves on the quality of our finishes. Our attention to detail has seen us achieve a loyal following. 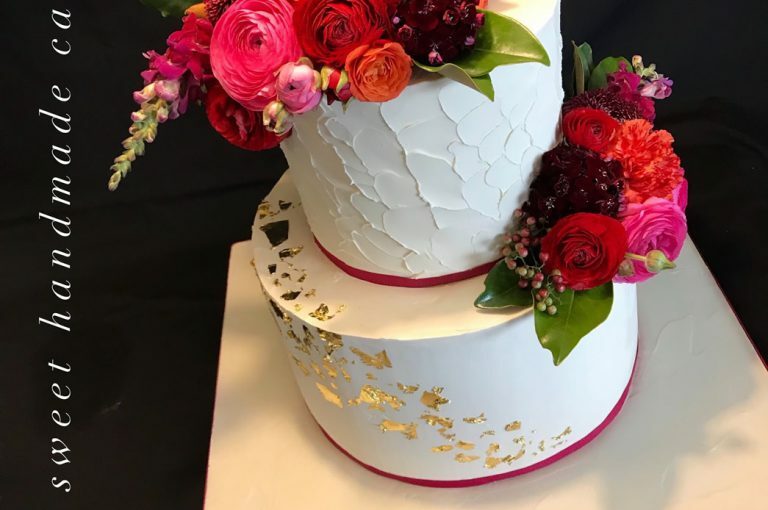 You will find a gallery of recent designs at www.eatsweethandmadecakes.com.au or book a consultation with Alexis to create your perfect design. Our mission is to bring the focus of the day back to what’s really important, THE LOVE! 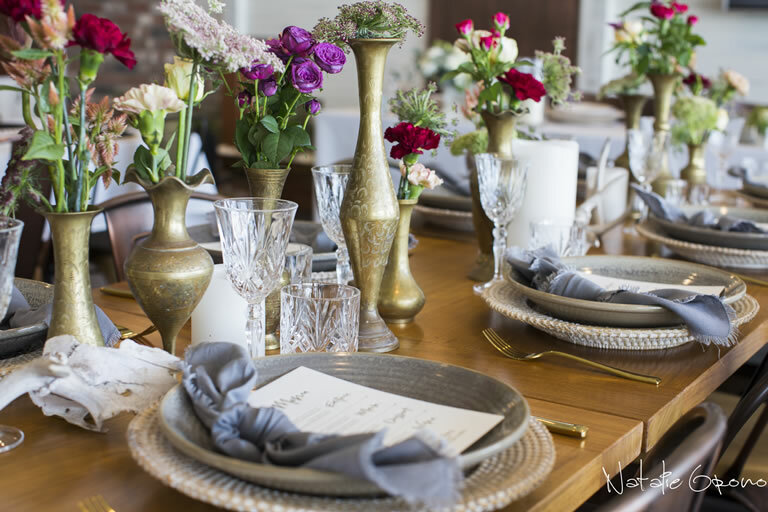 Wedding décor hire and styling plus assistance with council approval (if required). 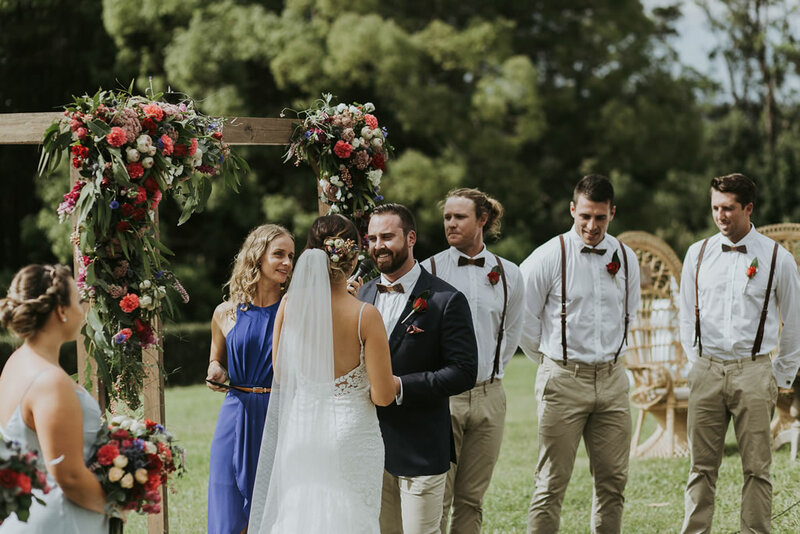 Whether you’re dreaming of a Byron Bay beachfront wedding ceremony; a romantic lush hinterland celebration; or escaping reality, just the two of you - eloping in style, we have you covered! 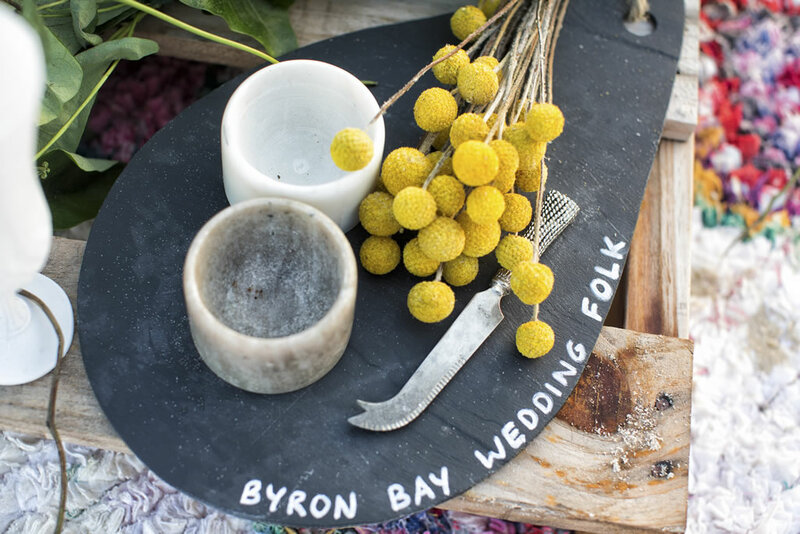 Byron Bay Wedding Folk is made up of three local girls; Alysha, Natalie, and Kirsty who are passionate about creating fresh and heart felt wedding ceremonies. They have a wealth of industry experience and plenty of local knowledge to share with you. 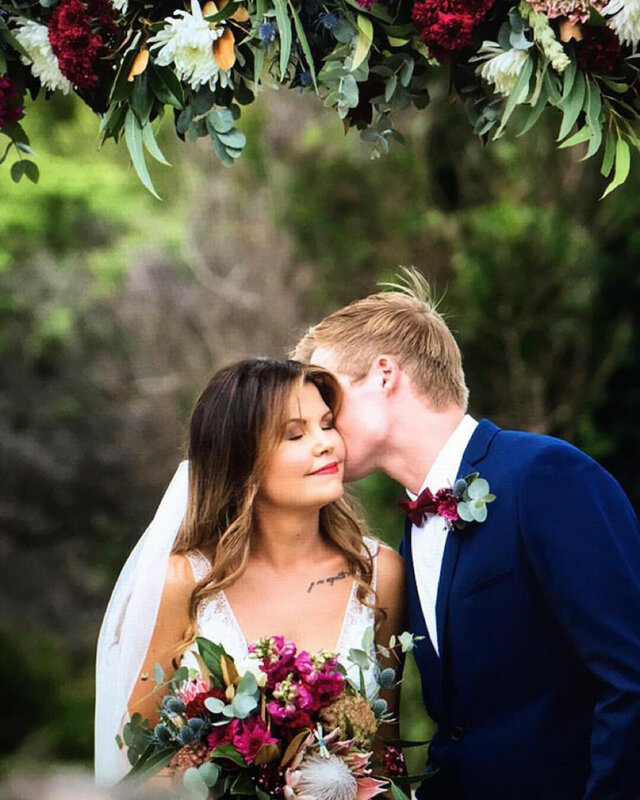 Together with Lennox Head’s Seven Mile Weddings they look forward to making your wedding ceremony unique, fun and memorable! Personal, relaxed and heartfelt ceremonies. 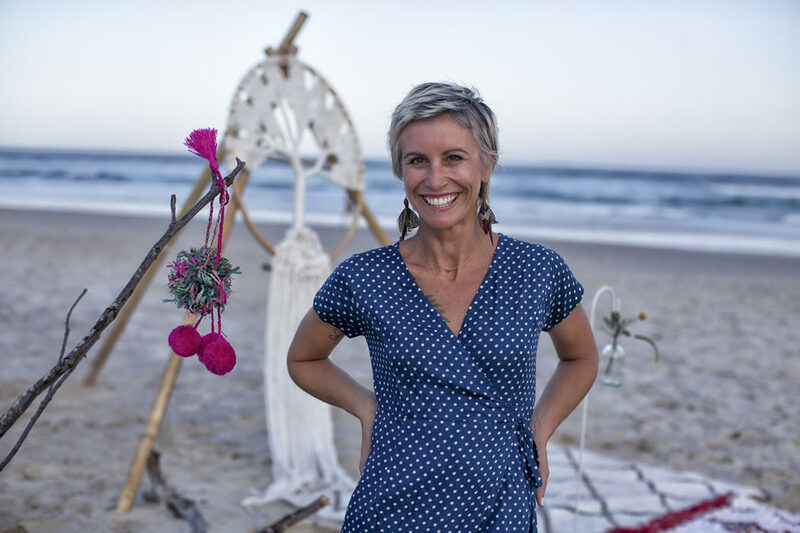 If you are looking for a down to earth celebrant for your wedding day who will aspire to design and deliver for you, a fabulous, fun and personal ceremony, then I really do look forward to meeting you! 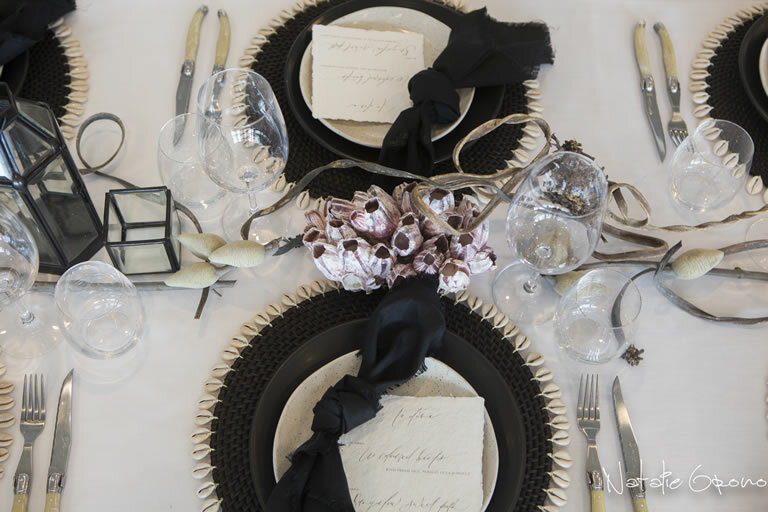 Alysha Trevillion: Stylist, Décor Hire and Council Approval. 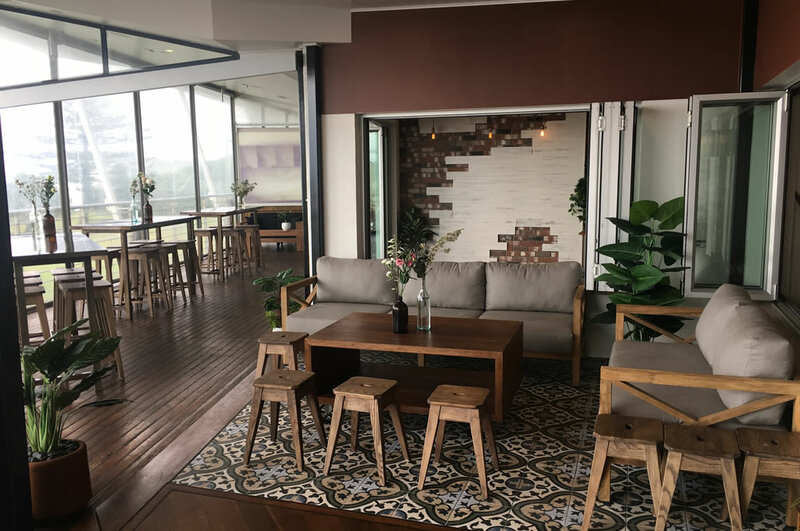 The décor is modern and practical and has been hand crafted using recycled timbers and mixed metals. The pieces are a perfect complement to a beach wedding ceremony with the sparking ocean as a backdrop. Let me introduce myself, my name is Natalie and I am lucky enough to call this lovely part of the world home. I love life and love a good love story hence my role as a wedding photographer! With a background in photojournalism and fine art photography I approach each wedding with a unique and attentive aptitude to capture the beautiful flow of your magic day. My style is documentary storytelling with a creative edge. I sincerely love my job and I love to celebrate your pure joy by creating wonderful memories for you to share forever! It’s your wedding day and you want to bring out your most beautiful self. Beautiful hair and make up should enhance and accentuate your best features so that you feel natural and like yourself, as you shine for the camera. Kaye Adam offers a bespoke warm-hearted experience so you can relax, have fun and enjoy this precious moment in time. Travelling to you, anywhere in the Lennox Byron area, and using biodegradable, non-toxic and earth friendly products where possible. 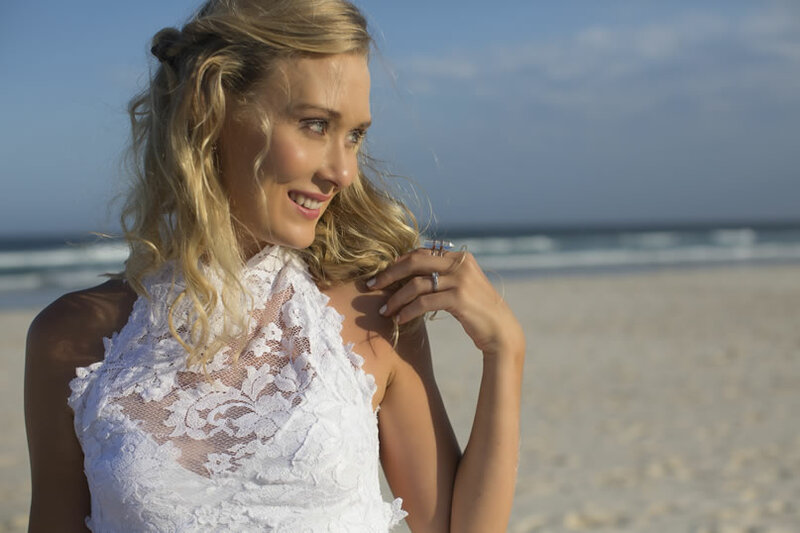 Beautiful Lennox Byron bohemian or relaxed beach bride, classic wedding hair and make up styles, contemporary and vintage looks - all flawless and natural will make you feel and look the beautiful, confident, gorgeous bride you are! 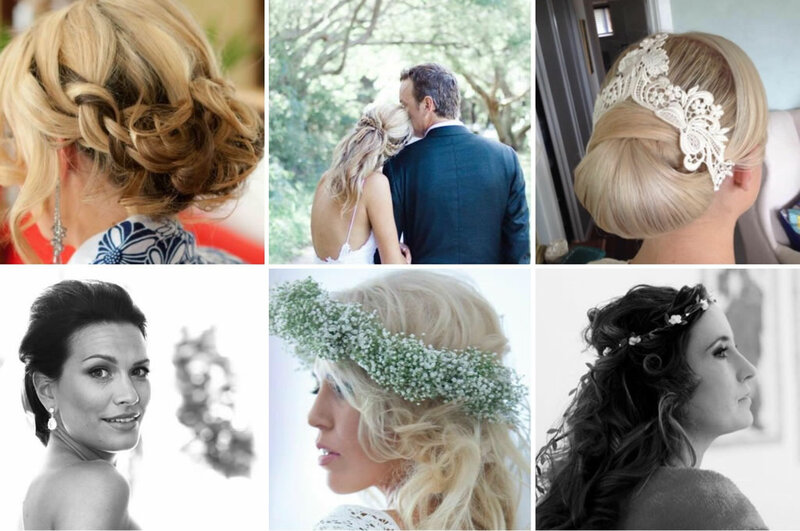 Kaye believes that your hair on your Wedding Day should be a thing of beauty. You want a gorgeous hairstyle that compliments your features, your dress, and your accessories. With Kaye’s experience, you can have everything you want. Ensure your wedding day is forever perfect with stunning creative eye makeup, long lasting flawless foundation and wedding make up to perfectly match your bridal makeup ideas, including false lashes, Smokey eyes, add in hair extensions, colour and accessories. Kaye will have your inner goddess glowing. Why not have a hair and make up trial, so that you can see exactly how your look is going to work. You and Kaye will create the whole look, complete with your hairpiece, including all of your veils, flower accents, and accessories. 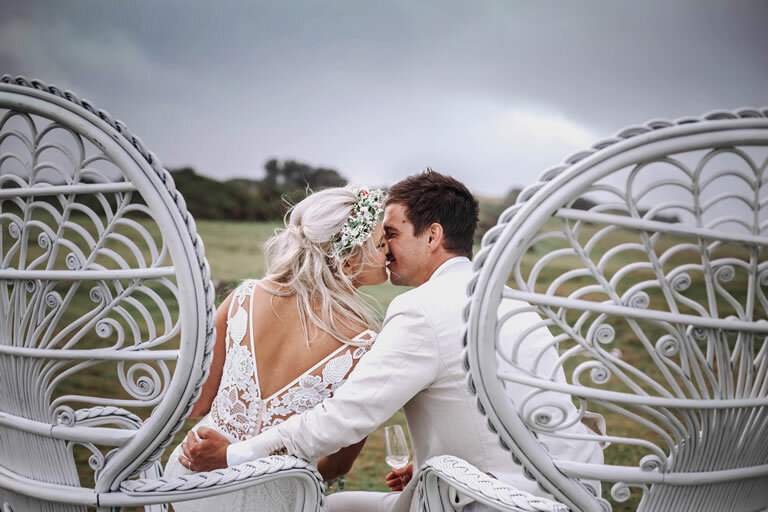 Anything that is not absolutely perfect for you will be adjusted so that on your dream Lennox Byron wedding day you can have the look you dreamed about. 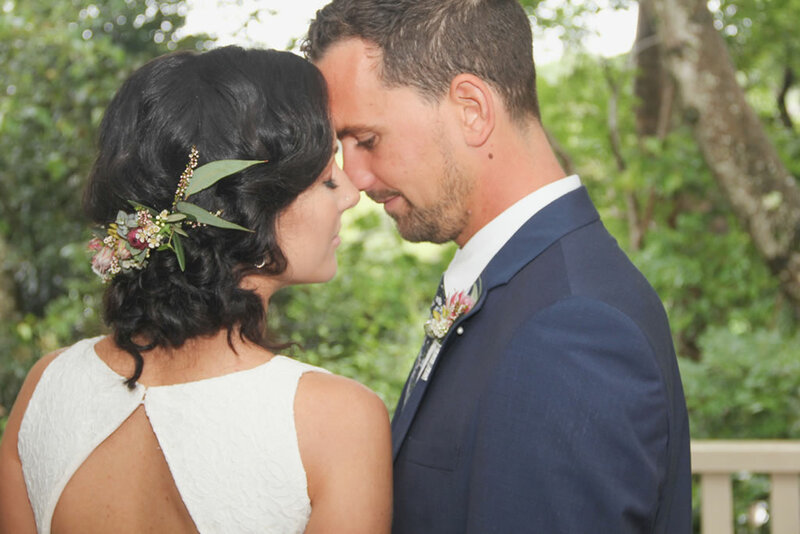 Get in touch with Kaye to chat about your most beautiful version of your bridal hair and make up, share your ideas and take inspiration to create your most magical day. 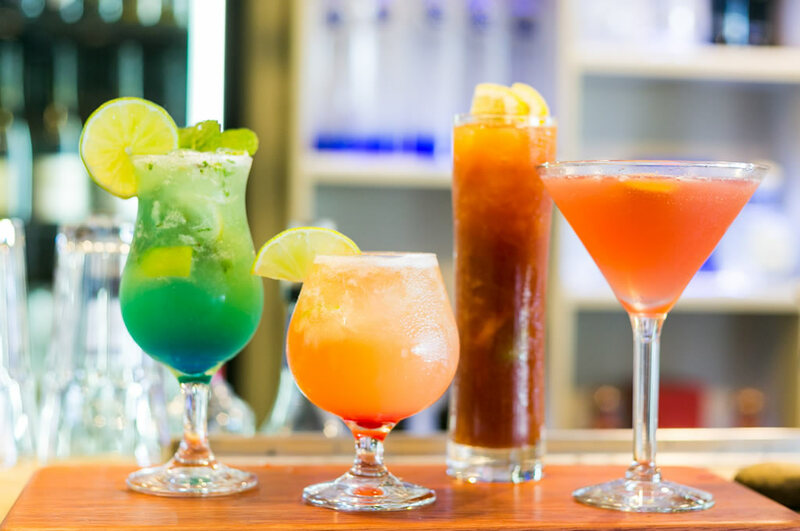 We have a range of beverage packages available, that can be personalised to suit your day. Dietary – all dietary requirements need to be identified with the final numbers one month prior to the day. 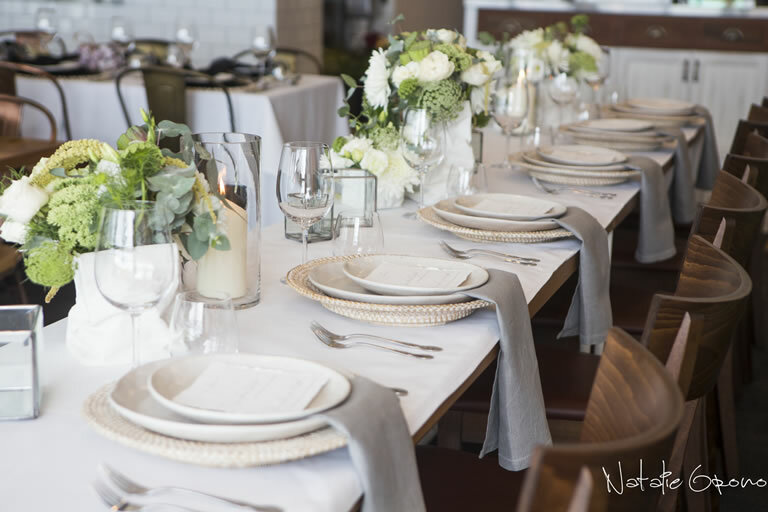 Your venue selection will depend on the style of wedding you desire for your special day. 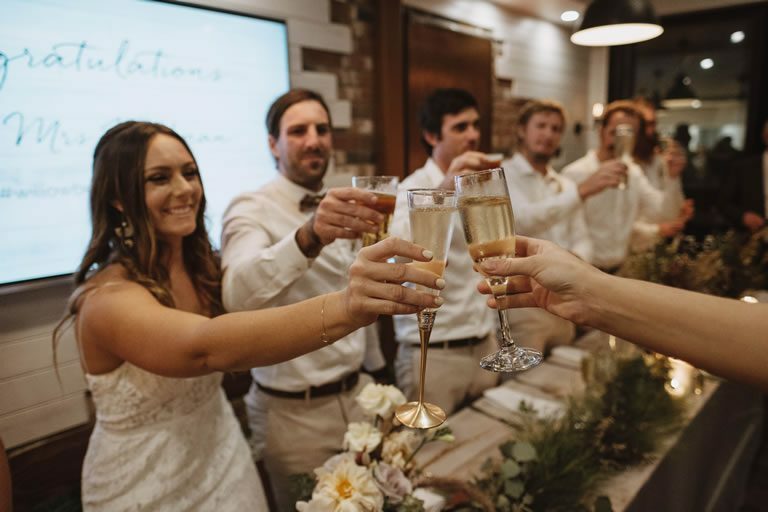 Seven Mile Weddings will assist you in planning and help you marry up the perfect reception so your day is exactly how you envision.